An important area of current research is whether large-scale penetration of variable renewable generation such as wind and solar power pose economic and operational burdens on the electricity system. 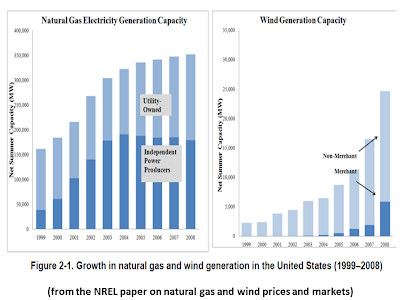 In such scenarios, this issue has also raised considerable interest in the potential role and value of electricity storage as a method of mitigating variability in generation associated with the inherently variable nature of these forms of generation. At the same time, a number of studies have pointed to the potential benefits of renewable generation as a hedge against the volatility and potential escalation of fossil fuel prices. 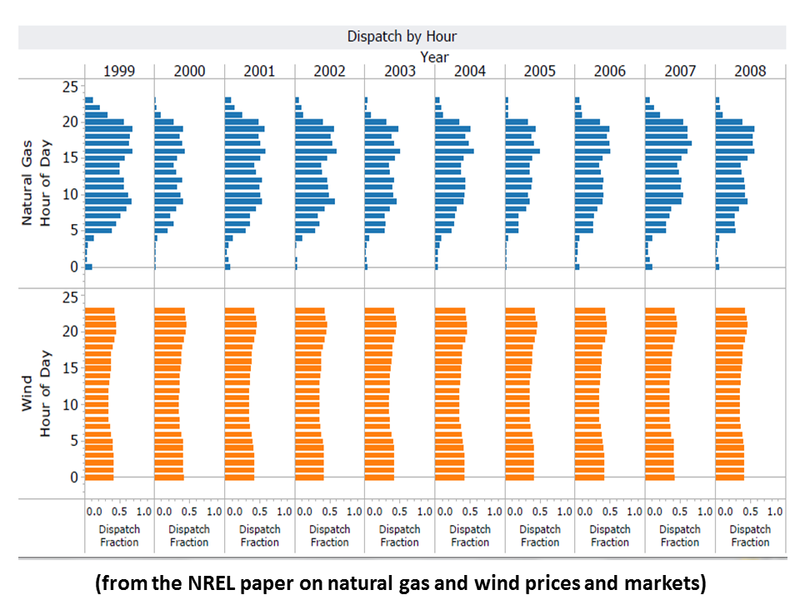 Prior research and this work suggest that the lack of correlation of renewable energy costs with fossil fuel prices means that adding large amounts of wind or solar generation may also reduce the volatility of system-wide electricity costs. Such variance reduction in overall system costs may be of significant value to consumers due to risk aversion. 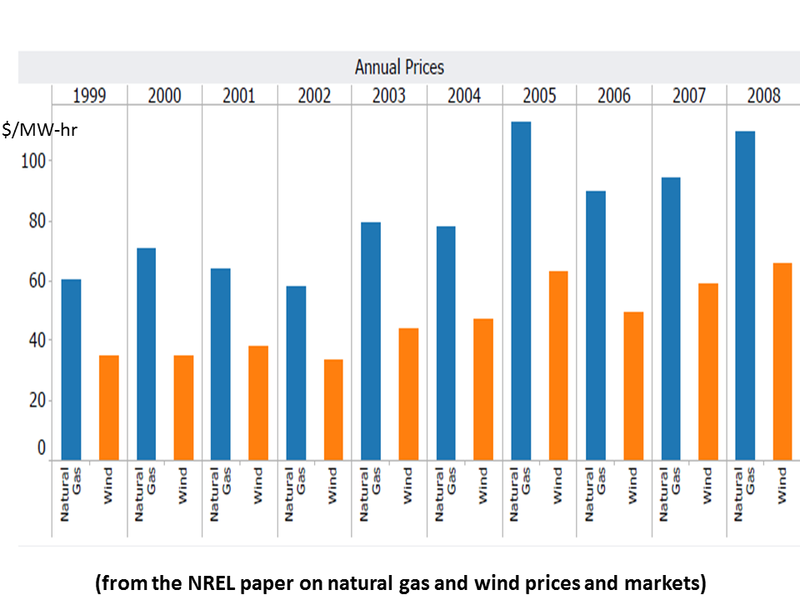 In contrast to this observation, other studies have focused on returns in restructured markets and noted that, in deregulated markets, baseload natural gas power generation may be relatively more attractive to investors because—unlike wind generation—peak power prices are often strongly correlated to natural gas prices. 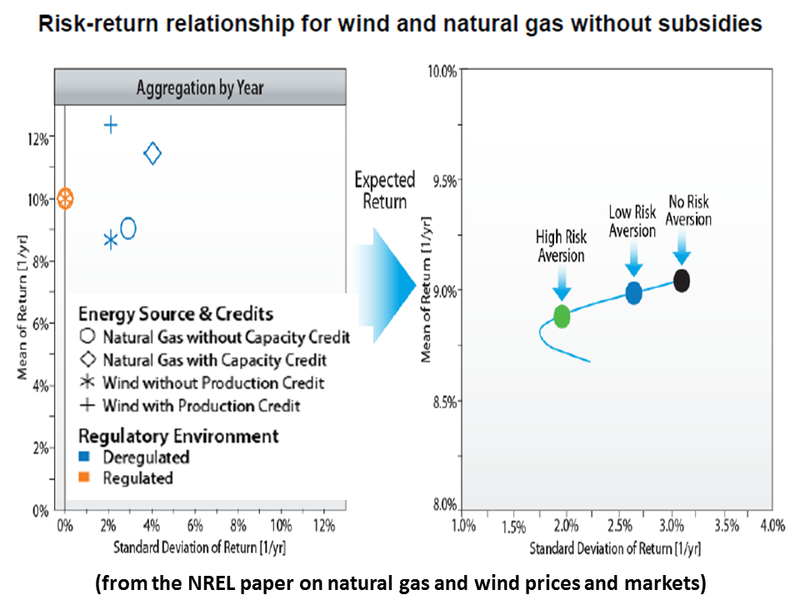 • Returns for natural gas generation are partially hedged because power prices are often set by natural gas generation, though with significant seasonal variations. • The impact of incremental net revenue from tax credits, such as production tax credits (PTCs) or other sources of revenue, can have a significant impact on the risk return relationship. In PJM over this period with credits, wind was found to be dominant in terms of risk and reward; that is, it had both greatest returns and the lowest risk, as measured by standard deviation of returns. 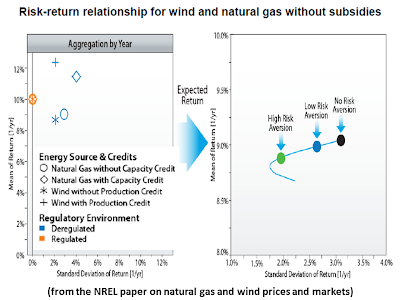 • More generally, without PTCs investors may benefit from investing in both wind and natural gas generation, with the optimal mixture depending on the investor’s risk aversion (and perhaps also loss aversion) preferences due to well-known lack of correlation effects. 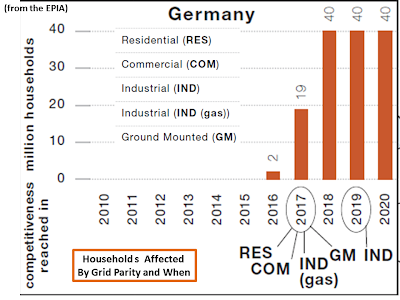 • While the opportunity for investors to diversify in broader markets may reduce some of the variance reduction benefits of investing in different electric technologies, it is unlikely to completely eliminate these benefits in the electric sector where power prices are often very volatile and positively skewed, which has implications for financial distress. • Consumers, especially smaller commercial and residential consumers, may benefit from reductions in the variance of electricity prices due to risk aversion and loss aversion effects. • The levelized cost of energy (LCOE) of different technologies is not directly comparable if they operate in different hours because the value of electricity differs significantly throughout each day. This variation reflects the daily load profile, with hourly load and hourly power prices also showing strong seasonal effects. 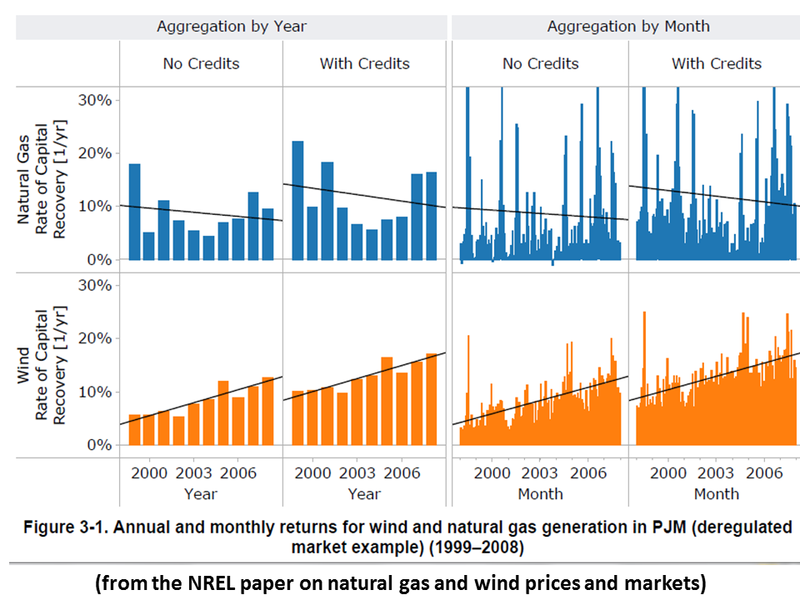 This effect can be seen in our analysis of PJM data when comparing the difference in the average annualized hourly price of variable wind generation and dispatchable natural gas generation. • The inherent nature of regulated markets means that producers earn, with some caveats, a utility-designated rate of return. A consequence of this is that the risk associated with fuel costs is passed on to the consumer. The “cost-plus” nature of regulation means that consumers also bear some increased risk associated with poor investment decisions. Consumers are partly compensated for this because the producer may be willing to accept a lower expected rate of return compared to deregulated markets. 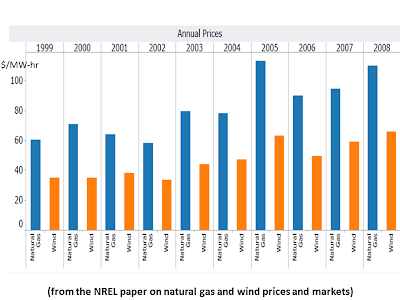 • For consumers, who are generally risk averse, the reduced variation in electricity prices (and hence consumer costs) because of wind’s lack of correlation with other system costs should have value (as has been suggested by others). Loss aversion also may place a value on variance reduction of electricity prices and consumer costs. • Simplified mean variance cost optimization techniques using annualized LCOEs for the power sector often fail because the assets within the portfolio are too dissimilar (e.g., baseload versus peaking or either of these versus a variable or non-dispatchable resources such as wind or solar). • A variance reduction-based technique could, however, be used more broadly under more sophisticated representation of system costs where the hourly operation of the technologies is modeled more explicitly. 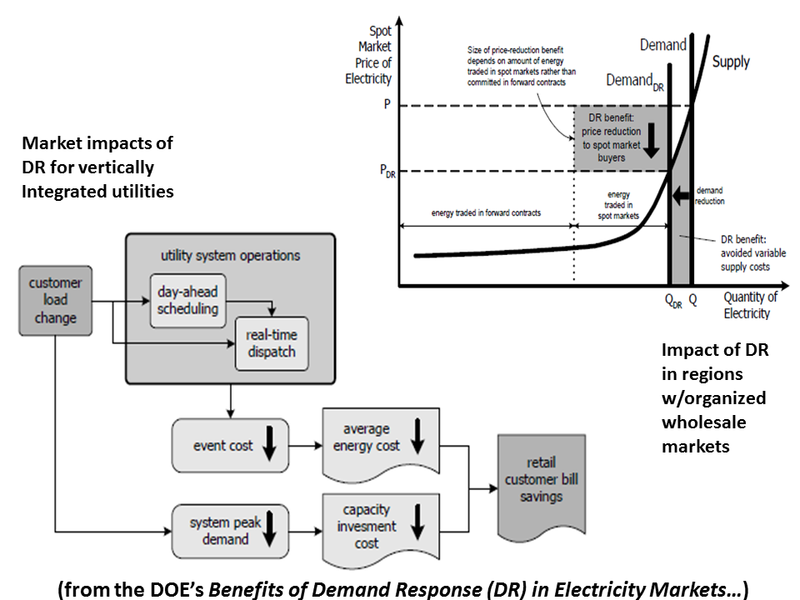 Specifically for a regulated electric system, the concept of lowest-cost planning could be refined to have an array of “least-cost planning” solutions corresponding to different variances, where the values of the expected annualized system cost and the standard deviation of the annualized system cost are physical properties of the electric system that are completely independent of any risk or loss aversion preferences. The value of variance reduction could then reflect both risk aversion and loss aversion. We discuss explicitly how to estimate the difference in the economic utility between alternative system-based, expected costcost variance choices, including the impact of the distribution being positively skewed toward higher costs. In conclusion, we should point out that while some of the observations and findings may be generally applicable, others are empirical observations for a specific location and a specific time period under specific technology cost and performance assumptions. "…It would be State Grid's first foray into the United States…China's cashed up state power groups have been scooping up bargains, with dominant power distributor State Grid establishing a presence in the Philippines, Brazil and Portugal…One driver for such deals is a tightly regulated Chinese market that holds down profits for power firms…[The] agreement…[and] specific details… are still under negotiation…"
"…[T]he Chinese company signed a deal to buy a 25 percent stake in Portuguese power grid operator REN for around $508 million. [I]t bought seven Brazilian power transmission companies with investments totaling nearly $1 billion…[A] consortium led by State Grid [won] operation of the Philippine power grid…[in] an auction for a 25-year operation license for $3.95 billion…AES, in which sovereign wealth fund China Investment Corp CIC.UL holds a 15 percent stake…[wants] to sell all or part of its businesses in China, a deal that could raise $300-400 million…"
"The total market for building-integrated photovoltaics (BIPV) glass will reach $6.4 billion in revenues in 2016, compared to $1.5 billion this year…. "Today's BIPV glass provides transparency well below 50%, and the initial markets for BIPV glass are found in skylights, facades, spandrels, curtain walls and atrium roofing, where high levels of transparency are not required…[B]y improving on the current level of transparency, manufacturers of BIPV glass may be able to expand their addressable markets…"
"[O]ne way that transparency can be improved is through new absorber materials, such as very thin layers of copper indium gallium diselenide or advanced dye-sensitized cells (DSC) using more transparent dyes…Another approach is to use advanced optics to enable the positioning of the PV panels so that they do not block sunlight to the same degree as in conventional BIPV glass panels, the report adds. "A similar evolution is expected to occur in the nature of the BIPV glass products themselves. Currently, all BIPV glass is highly customized to the needs of specific projects…[A]s BIPV glass shifts…to the broader commercial construction market, off-the-the-shelf products will have to be developed that can be sold through large construction firms and PV systems integrators…[F]uture generations of BIPV glass products will be characterized by monolithic integration and the incorporation of lighting, dimming and self-cleaning capabilities." Viridity, ConEd Solutions Take On Demand Response 2.0; Viridity and ConEd Solutions launch a commercial-scale effort to turn buildings into energy market resources. 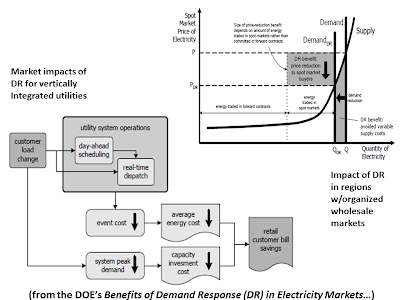 "Demand response -- turning down building power loads to shave peak grid demand -- sometimes gets split into 1.0 and 2.0 versions…[DR 2.0] comes when buildings can lower their peak power use not only to respond to utility emergency calls (DR 1.0), but to actually bid their power reduction into energy markets…But to manage it, this DR 2.0 technology has to stretch from the individual building, all the way to the energy markets where blocks of power are bought and sold every day...Viridity Energy and big energy services company ConEdison Solutions…[have built a platform to do that and thereby offer] building owners a chance to lower power bills and bring in new energy revenues, all at little to no cost. "The program has…a big target market, in the form of ConEd Solutions’ energy services (ESCO) and commodity energy trading customers…As a sister company of New York utility Consolidated Edison, ConEd Solutions is comparable to Honeywell and Johnson Control in terms of ESCO work, and competes against the likes of Constellation Energy and Dominion Power in the business of buying and selling power for big customers." "…ConEd Solutions’ big customer base gives it an advantage…[and] its energy commodity trading business [offers] more insight into how to better manage customer energy use to lower their rates and bills…Viridity has also proven its ability to handle both the emergency capacity demand response markets, which pay customers a monthly fee in exchange for a promise to cut power drop a few times a year, and the energy, or economic, demand response markets, where customers actually bid power reductions into energy markets…"
At the request of the U.S. Department of the Interior (DOI) and the Bureau of Land Management (BLM), the National Renewable Energy Laboratory conducted an analysis to estimate the gap between the renewable energy (RE) generation supply and demand in the western states, and how that impacts BLM activities in this sector. 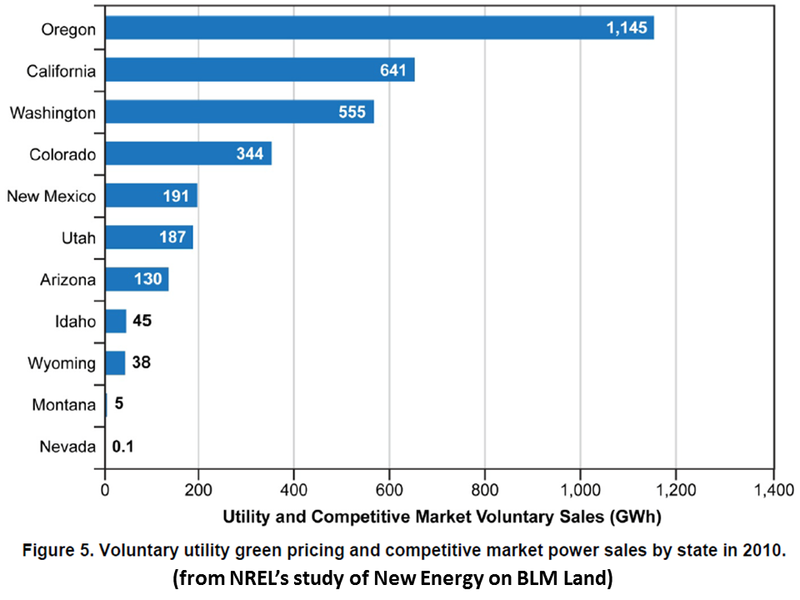 The purpose of this analysis is also to provide DOI and BLM with an overview of RE markets, transmission planning efforts, and the role of BLM RE projects in the electricity markets of the 11 states (Arizona, California, Colorado, Idaho, Montana, Nevada, New Mexico, Oregon, Utah, Washington, and Wyoming) that comprise the Western Electricity Coordinating Council (WECC) Region. 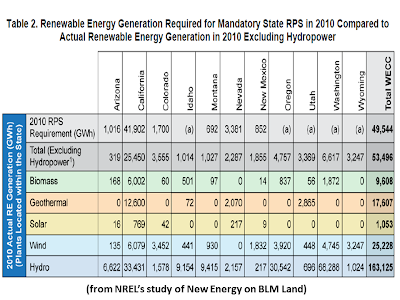 Without new policies at either the state or national level, and without the extension of special federal programs3that support the development of renewable electricity facilities, current state renewable portfolio standards (RPS) requirements will remain the primary driver for new RE deployment in the western United States. The quantitative portion of this analysis is based on RPS-driven demand, because projections for that demand are available. Other market drivers will also play a part in motivating investment decisions, such as the voluntary consumer market, other federal and state incentives of various types, utility decisions driven by improving RE economics and transmission availability, and other policies that arise from the desire of some states to diversify their economies and create green jobs. Modeling the impacts of these other drivers was beyond the scope of this analysis. In total, the WECC states in 2010 generated more than their total RPS requirement for RE [53,500 gigawatt-hours (GWh) generated compared to 49,500 GWh required for RPS policies]. To analyze the possible gap between demand and supply in RE in 2020, three datasets were compared: one for demand and two for supply. The comparison was made in terms of capacity, rather than generation, to meet the needs of the BLM. • The source data for future demand was taken from analysis by Lawrence Berkeley National Laboratory (LBNL) of state RPS requirements (Barbose 2011), and includes projected RE generation required in 2020 to meet today’s RPS requirements. 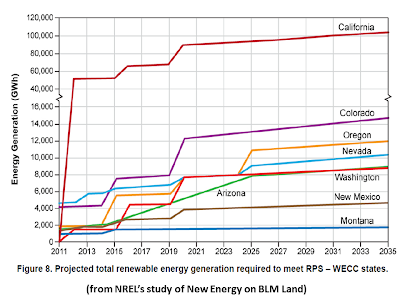 The total RPS-required demand for WECC states in 2020 is estimated to be 134,000 GWh. To convert this generation requirement into a demand in terms of capacity, three different approaches to capacity factors were used: LBNL’s approach based on an average capacity factor of 50%, a scenario using a lower capacity factor (26%), and a scenario using a higher capacity factor (53%). These different approaches estimated that WECC states in 2020 may require installed capacity in the range of 28,000 MW to 46,000 MW, as shown in Table ES-1. This required capacity does not include RE demand that may result from voluntary consumer demand or other types of market drivers. Various market factors could increase or decrease these market estimates. 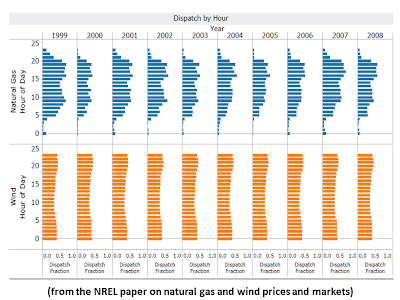 States could revise RPSs downward or electricity demand could decrease in the future. 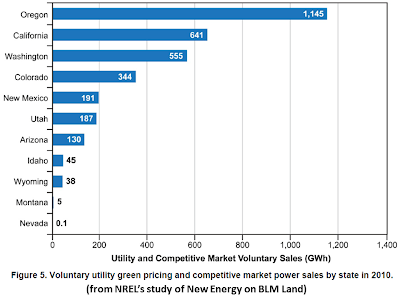 As a point of reference, nationwide voluntary consumer demand markets totaled 35,000 GWh in 2010. 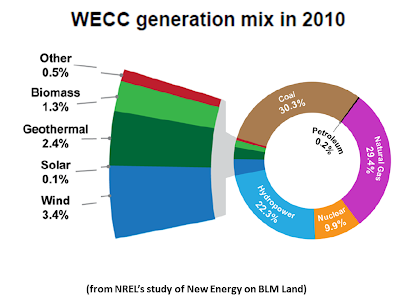 • One source of data for supply was the current (2010) installed capacity of RE in WECC states. 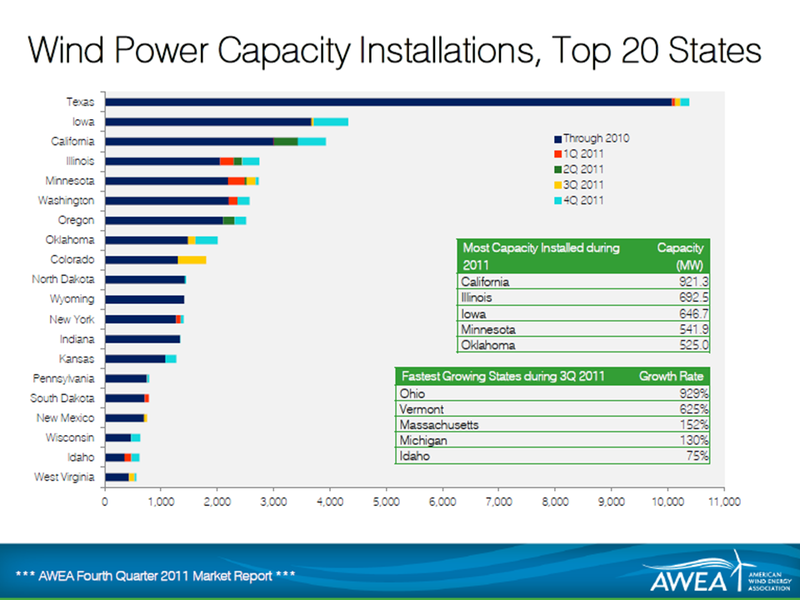 Actual installed nameplate capacity in December 2011 was about 18,400 MW (SNL 2011b), as shown in Table ES-1. • The other source of data for supply was taken from planned projects as tracked by SNL Financial (SNL 2011a). Only planned projects that are under construction or in advanced development4were included in this analysis; the planned capacity of these projects totals about 18,900 MW. The output from planned projects was assigned to states based on the location of the power purchaser, if known (about two-thirds of the planned capacity); if not known, the output was assigned to the state where it is planned to be located (about one-third). Some larger power purchasers sell their power across several states. In those cases, a recent analysis (Hurlbut 2011) examining each utility’s power purchase agreements was used to apportion the output. 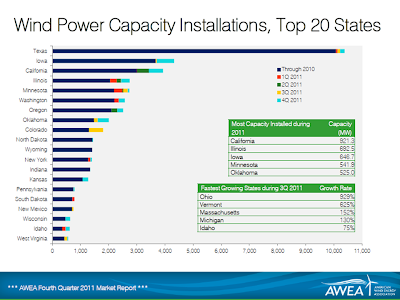 The sum of actual installed capacity today and planned capacity is about 37,000 MW, as shown in Table ES-1. • Compared to the range of required RE capacity, Table ES-1 shows that the gap between demand and supply in 2020 ranges from a potential oversupply of 8,000 MW to an unmet demand of 9,000 MW. Because the demand estimates were only based on meeting RPS requirements, other types of market drivers, as mentioned above, should also be investigated within each state, to present a more complete picture of 2020 demand. 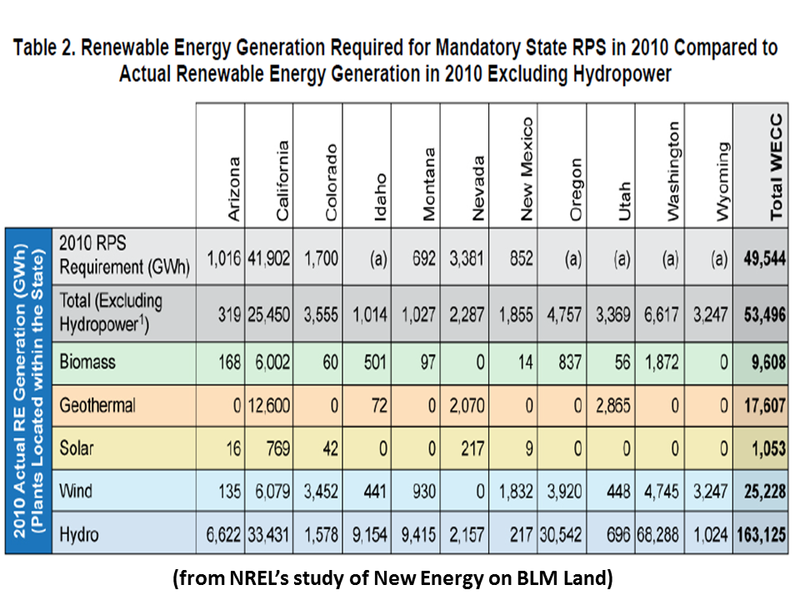 The BLM is required by the Energy Policy Act of 2005 to approve 10,000 MW of non- hydropower renewable energy to be located on public lands by 2015. To date, the BLM has approved or authorized more than 5,200 MW of RE on federal lands.5 Another approximately 8,000 MW in advanced development is included in the BLM list of 2011 and 2012 high priority projects. 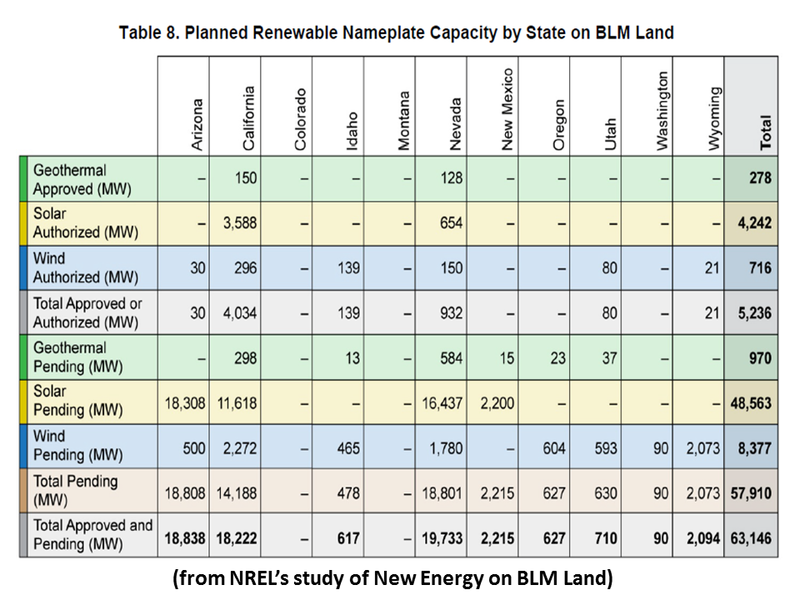 Based on this list and the progress made in 2011, the BLM appears to be on track to meet its EPAct goal of authorizing 10,000 MW by 2015, and indeed is likely to accomplish this goal by late 2012 or early 2013. 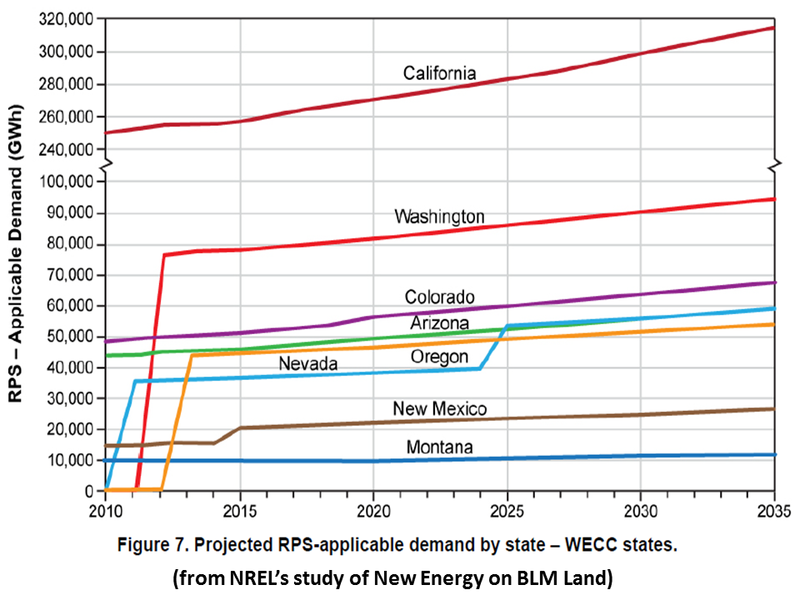 The 5,200 MW of approved or authorized BLM projects represent 11%-18% of the projected capacity additions needed to meet RPS requirements in WECC states by 2020. 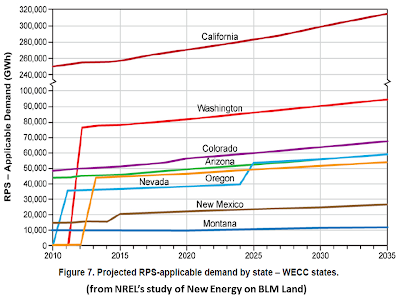 It should be noted in Table ES-1 that California is the primary driver for RE development across the WECC, representing over half of projected 2020 demand. California’s demand has in-state as well as regional implications for transmission, and its policy environment moving forward will be a critical influence on future RE supply/demand balance. 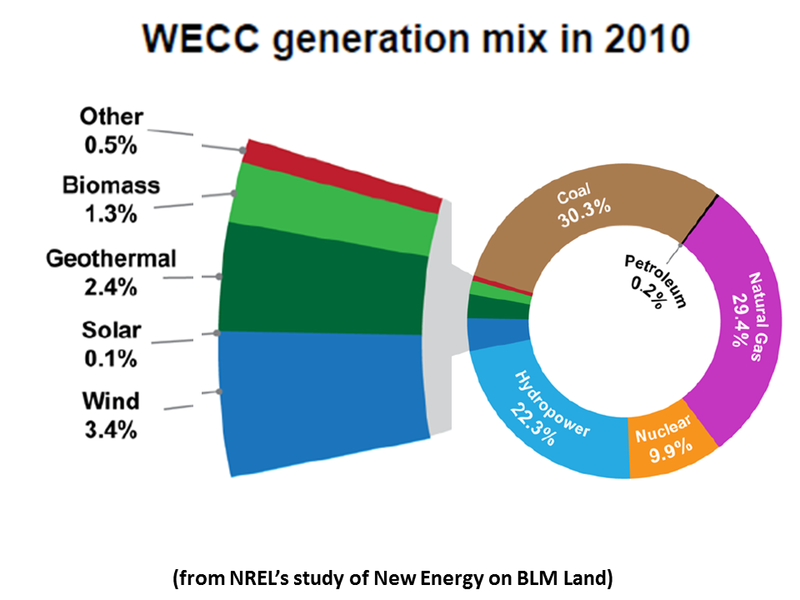 • In total, WECC’s highest priority (“foundational/common case”) transmission projects would add more than 5,500 line miles, which may ultimately improve the viability of some of BLM’s planned projects (WECC 2011). • The interagency Rapid Response Transmission Team, initiated in 2011 through the U.S. Council on Environmental Quality, recently announced a coordinated and expedited permitting process for seven pilot transmission lines. Five of these lines are located in the western United States, and the BLM is the lead agency on four of these five lines. The focus on these lines represents a concentrated effort to connect potential renewable energy supplies with loads in the northwest and in southern California. 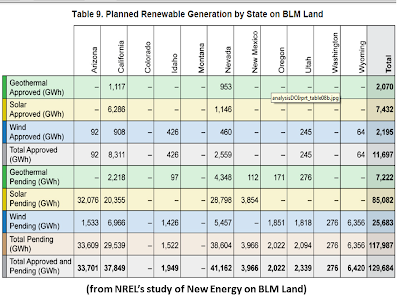 • Most of the BLM’s priority wind and geothermal projects are within 20 miles of existing transmission lines; most of BLM’s priority solar projects are within five miles of existing transmission lines. The analysis of whether there is capacity available on these lines, or whether they could be upgraded, has not been undertaken at this time. • In general, new RE development projects sited close to load centers are less likely to be impacted by constraints of the current transmission infrastructure over the next 10 years; however, for more remotely sited RE projects, which will likely include some of the BLM projects, additional transmission infrastructure will be required. The additional 19,600 miles of new transmission lines (between 115 and 500 kV) currently planned for WECC states will support some of the expansion required for RE deployment required to meet western state mandatory RPS requirements. In some cases, the cost of some renewable resources located remote to load may offer the potential to reduce overall costs to ratepayers of meeting RPS requirements (WECC 2011). Based on the analyses of supply and demand in WECC states, and BLM’s interests in leasing land for RE projects, a number of specific suggestions are provided below to advance BLM efforts in this sector. Update the RE project list. The information on BLM projects presented in this report changes frequently. Reviewing and updating the status of the projects on the master RE project list will help BLM prioritize necessary actions. The BLM Washington office has recently issued a call for information and data for geographic information systems (GIS) analysis of the wind and solar projects that the BLM’s state and field offices are tracking. This information will be useful for updating the status of projects for FY12. Focus on high-value project sites. In addition to the approved and high priority projects, BLM has received applications for more than 58,000 MW of renewable energy projects on public lands. 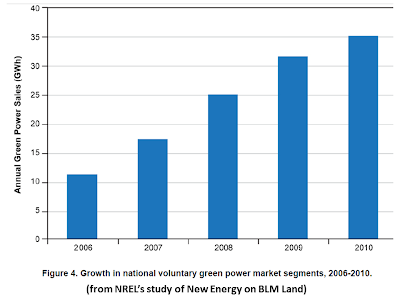 The integration of BLM RE projects with planned transmission lines (especially the five pilot lines) will take on greater significance over the next few years, and BLM lands within potential interconnection distance of these lines are likely to see increased interest by industry, provided that these lands also meet all other suitability criteria for development. Further, any suitable BLM lands that are located close to load centers in states that are falling short of RPS requirements, or are located in regions that can potentially export to California, may see increased interest from developers. BLM should consider screening these lands, the solar energy zones, and other regions undergoing landscape-level planning (e.g., the Desert Renewable Energy Conservation Plan [DRECP], the West Chocolate Mountains Renewable Energy Evaluation Area, and the Arizona Restoration Design Project), against criteria designed to identify prime sites for future competitive leasing requests. Work with other federal agencies and developers to facilitate project siting. A number of federal agencies, including other DOI bureaus and agencies, the Department of Defense, Department of Homeland Security, Department of Agriculture, Department of Energy, and Department of Commerce are interested in deploying renewable energy technologies to meet their internal mission goals. As specific examples, the Environmental Protection Agency’s RE-Powering America’s Land program seeks to promote the development of renewable energy projects on brownfield sites such as abandoned mining lands, landfills, and contaminated lands. The Bureau of Indian Affairs and many tribes are working to develop renewables on tribal lands. Developers are also targeting state, local, and private lands. Similar to the approach being taken by the BLM’s Restoration Design project in Arizona, BLM could benefit from continuing to work cooperatively with other agencies and industry to identify and better understand the optimal suitable locations for development, regardless of land ownership. Site projects to help support critical national needs. 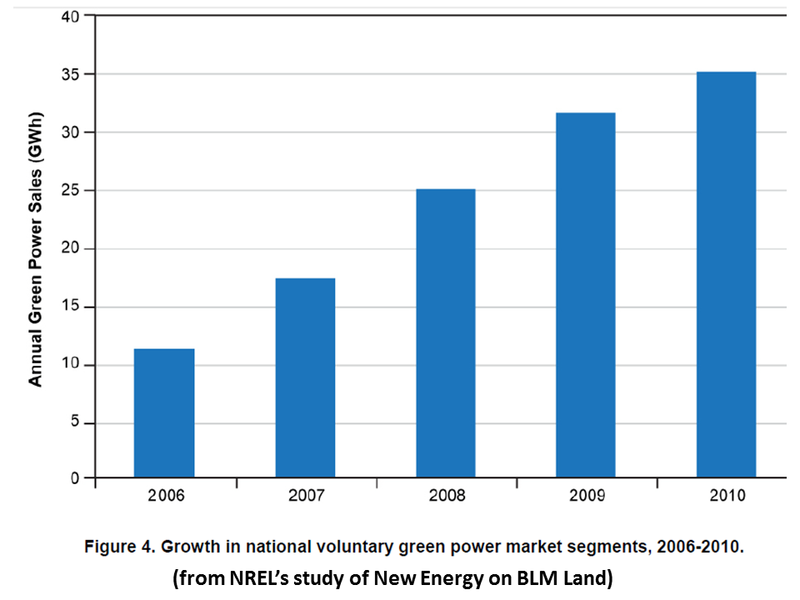 Similar to the strategy of siting RE to take advantage of drivers and interests of other agencies and private developers, there may be opportunities to increase the strategic value of BLM’s RE projects by co-locating in prime areas that would also support national or regional energy security and resiliency, and support national environmental goals. As an example, BLM projects could be sited in locations that, in an emergency situation, could help supply power for critical loads such as water pumping and treatment facilities, hospitals, military installations, National Guard facilities, critical substations, radar sites, data centers, and other high value loads. In some cases, BLM may choose to work with the developers and recommend a shift of the BLM projects to other locations in the region that may offer greater strategic advantages. Continuing to avoid projects on environmentally sensitive lands will support national environmental goals. GIS and additional landscape level planning analyses such as those being undertaken by the DRECP and WECC’s Environmental Data Task Force can help identify these specific locations and opportunities. Specific examples and case studies could be assessed in greater detail. Identify options to integrate projects into existing fossil fuel generation. Siting RE projects near old, retiring or seldom used fossil fuel plants takes advantage of existing infrastructure and potential synergies. For example, BLM lands located near existing coal or gas plants may be candidate sites for solar thermal plants that are constructed from the outset to integrate fully into existing facilities. The National Renewable Energy Laboratory (NREL) and the Electric Power Research Institute recently completed an initial screening of fossil fuel plants that may be suitable for solar augmentation (NREL 2011). However, additional detailed work is needed in this area. Absent new policy drivers and without the extension of the DOE loan guarantee program and Treasury’s 1603 program, state RPS requirements are likely to remain a primary driver for new RE deployment in the western United States. Assuming no additional policy incentives are implemented, projected RE demand for the WECC states by 2020 is 134,000 GWh. Installed capacity to meet that demand will need to be within the range of 28,000-46,000 MW. 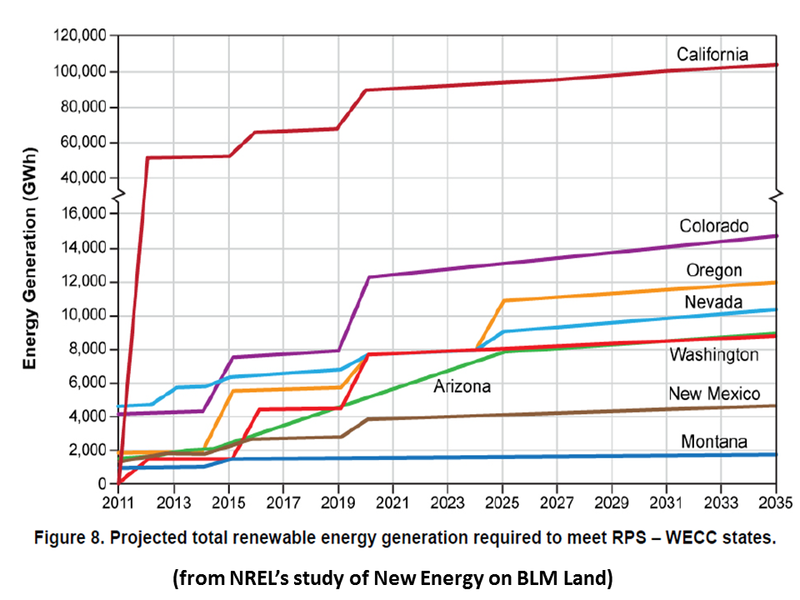 BLM projects that are currently authorized or approved should provide 11%-18% of the total capacity (9% of the generation) needed to meet the 2020 RPS requirements across WECC. 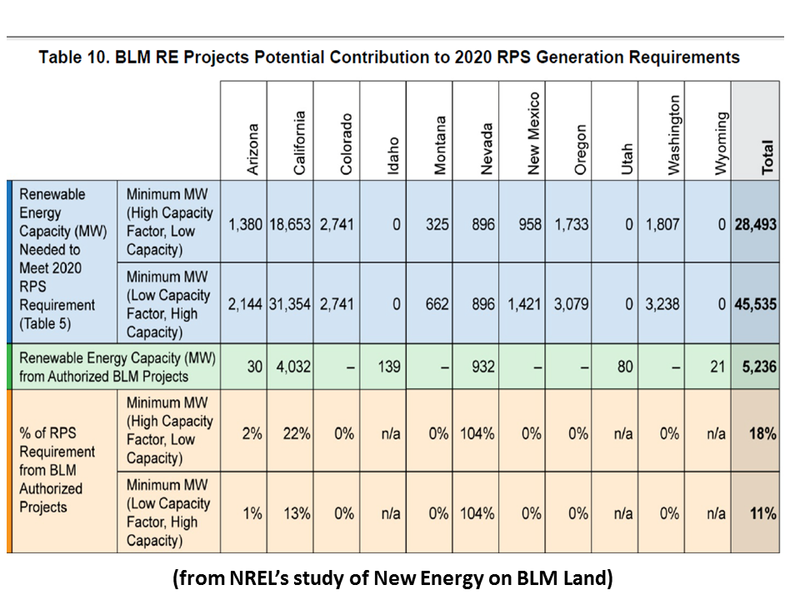 If all of the currently authorized and 2011/2012 high priority BLM RE projects are deployed, RE projects on public lands will support 35% of the 2020 total requirement for new RE capacity. 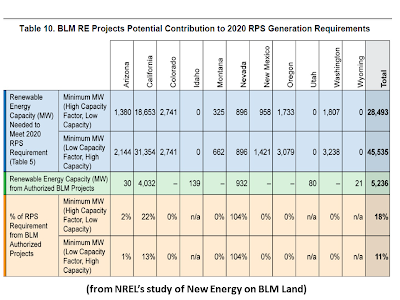 With 5,200 MW of RE authorized or approved, and approximately 8,000 MW of additional 2011 and 2012 high priority projects, the BLM appears to be on track to meet the EPAct 2005 requirement of approving 10,000 MW of RE on public lands by 2012. 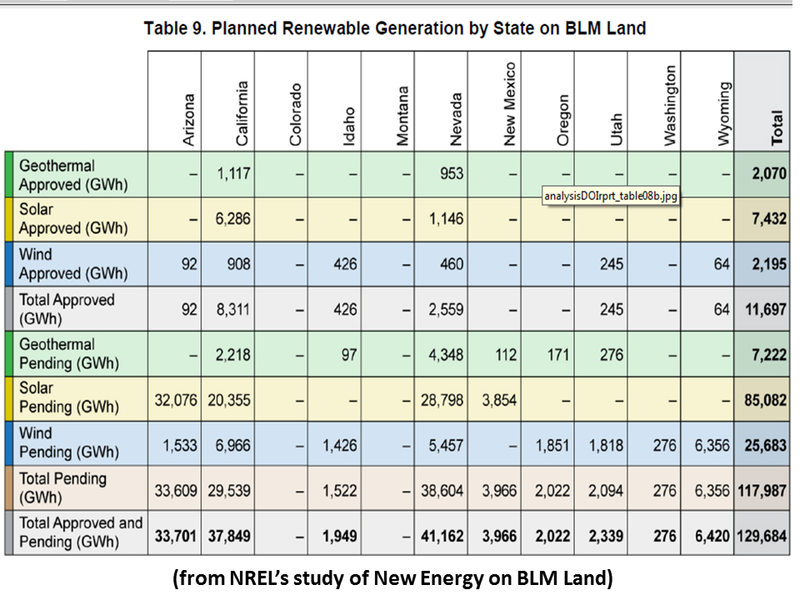 Most of the BLM’s priority wind and geothermal projects are within 20 miles of existing transmission lines; most of BLM’s priority solar projects are within five miles of existing transmission lines. 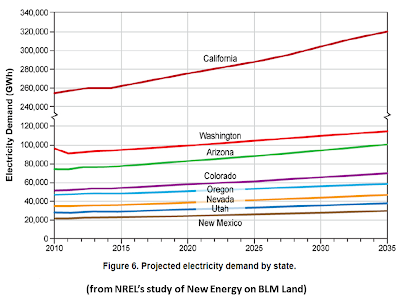 New RE development projects sited close to load centers are not expected to be constrained by the current transmission infrastructure over the next 10 years; however, for more remotely sited RE projects, which some of the BLM projects will likely be, additional transmission infrastructure will be required. The additional 19,577 miles of new transmission lines (between 115 and 500 kV) currently planned for WECC states will support some of the expansion required for RE deployment required under western state mandatory RPS. 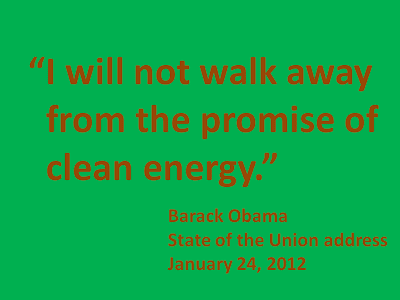 Update the renewable energy project list. The information on BLM projects presented in this report changes frequently. 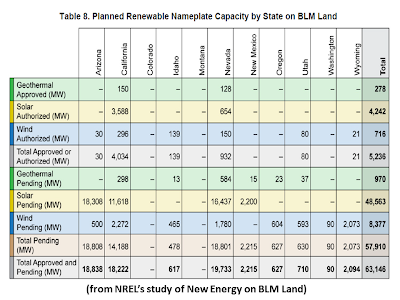 NREL suggests that at least once per year, BLM go through its master project list and obtain updates on the status of the projects on its books. The BLM Washington office has recently issued a call for information and data for GIS analysis of the wind and solar projects that BLM’s state and field offices are tracking. This information should be useful for updating that status of projects for FY12. Focus on high-value project sites. 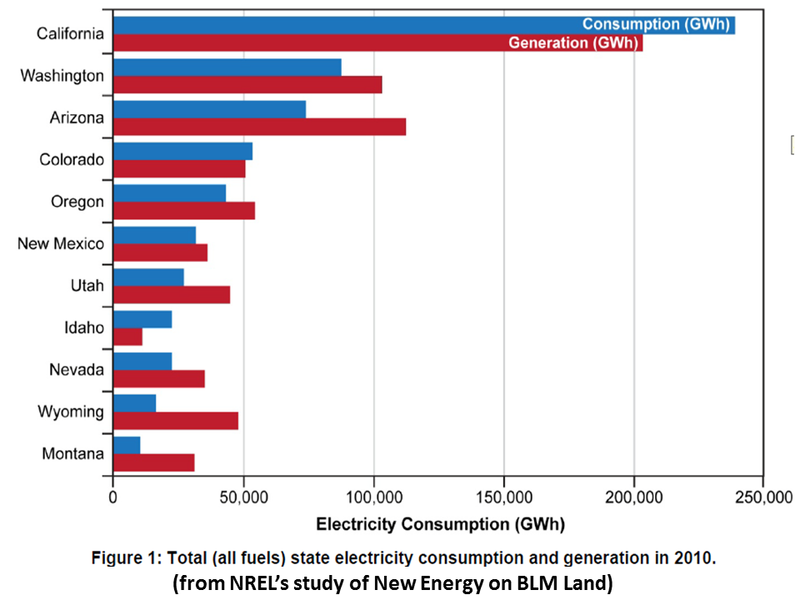 The integration of BLM renewable energy projects with planned transmission lines (especially the five pilot lines) will take on greater significance over the next few years, and BLM lands within potential interconnection distance of these lines are likely to see increased interest by industry. Also, any BLM lands that are located close to load in the desert southwest in states that are potentially falling short on RPS requirements may see increased interest from developers. BLM should consider screening these lands, and the solar energy zones and other regions undergoing landscape-level planning, against criteria designed to identify prime sites for development of competitive leasing requests. Work with other federal agencies and developers to facilitate project siting. A number of federal agencies, including other DOI bureaus and agencies, the Department of Defense, Department of Homeland Security, Department of Agriculture, Department of Energy, and Department of Commerce are interested in deploying renewable energy technologies to meet their internal mission goals. As specific examples, the Environmental Protection Agency’s RE-Powering America’s Land program seeks to promote the development of renewable energy projects on brownfield sites such as abandoned mining lands, landfills, and contaminated lands. The Bureau of Indian Affairs and many tribes are working to develop renewables on tribal lands. Developers are also targeting state, local and private lands. Just as BLM has done with its Restoration Design project in Arizona, the BLM could benefit from continuing to work cooperatively with other agencies to identify the most suitable locations for development, regardless of land ownership. Site projects to help support critical national needs. 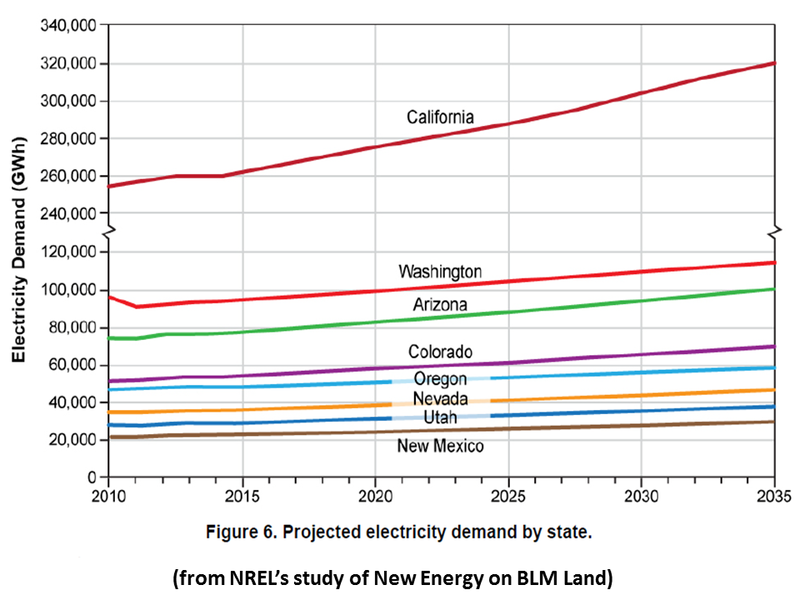 Similar to the strategy of siting projects to take advantage of projects and interests by other agencies and private developers, there may be opportunities to increase the strategic value of BLM’s renewable energy projects by co-locating in areas that would support national or regional energy security and resiliency, and support national environmental goals. As an example of this, BLM projects could be sited in locations that, in an emergency situation, could help provide power supply for critical loads such as water pumping and treatment facilities, hospitals, military installations, National Guard facilities, critical substations, radar sites, data centers, and other high value loads. In some cases, BLM may choose to work with the developers and recommend a shift of the BLM projects to other locations in the region that may offer greater strategic advantages. Continuing to avoid projects on environmentally sensitive lands will support national environmental goals. GIS analysis can help identify these specific opportunities. Identify options to integrate projects into existing fossil fuel generation. Siting renewable energy projects near old, retiring, or seldom used fossil fuel plants takes advantage of existing infrastructure and potential synergies. For example, BLM lands located near existing coal or gas plants may be candidate sites for solar thermal plants, including those with thermal storage, that are constructed from the outset to integrate fully into existing plants. "In a step to reverse Europe’s falling share of clean energy investment, GE has partnered with British non-profit Carbon Trust to infuse the European clean tech sector with fresh capital. The initial phase of the alliance includes a business incubation fund of $5 million to support new low carbon technologies in infrastructure applications. The initiative is an extension of GE’s ecomagination Challenge – a $200 million global program to find and fund the best ideas in clean technology. "Some of the impetus to forge the new relationship came from trends revealed in a Bloomberg New Energy Finance report that shows a discouraging 40% drop in Europe’s share of clean energy investment over the past five years, a period during which Asia Oceania almost doubled its share." "GE’s Innovation Barometer shows that roughly half of UK businesses see the UK as a challenging environment for innovation. 84% of them also believe that developing partnerships and collaborating with a combination of players – including government, big business, SMEs and individuals – is crucial for their success in innovation. "In light of those facts, Carbon Trust will work with GE to sift out the most promising early stage companies focusing on clean tech infrastructure in areas such as smart grids, lighting systems, heating and ventilation and building controls. Those fortunate start-ups will receive funding and support from GE and Carbon Trust…"
"Siemens will supply 176 SWT 2.3 108 turbines…[and] five-year maintenance…[to projects in Iowa’s] Vienna, Marshall and Tama counties (103.5MW)…Eclipse, Guthrie and Audubon counties (200MW)…[and] Morning Light, Adair County (101.2MW)…"
"…The turbines will be produced in Siemens’ factories at Fort Madison, Iowa, and Hutchinson, Kansas. The nacelle assembly facility in Hutchinson was opened in December, for Siemens’ 2.3MW and 3MW turbines." 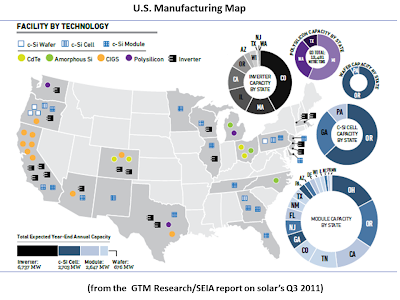 "Despite the outlook for the PV manufacturing equipment market remaining bleak in 2012, a new report from IMS Research forecasts that there could be a 20 GW opportunity for the upgrade or replacement of existing capacity over the next four years. 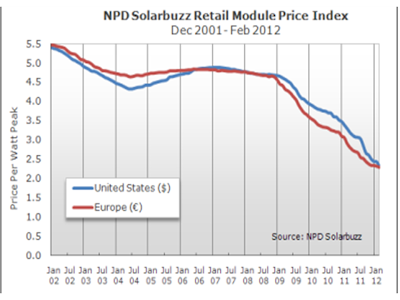 "…[R]evenue declines of over 65% are forecast for the PV manufacturing equipment market in 2012. However, a new opportunity has been identified as equipment vendors seek out new market bright spots in the industry." "Aging equipment requiring upgrade or complete replacement represents the biggest opportunity currently and this is where the majority of equipment revenues will come from in 2012…[T]his could provide a 20 GW opportunity for equipment suppliers, generating some $25 billion in revenues over the next four years. "Ingot, wafer, cell and module makers are all placing less criticality on expanding production, and are instead focusing on increasing end-product quality and overall efficiencies. Utilization rates are at an all-time low and the current lull in new demand and capacity across the supply chain will provide a potential opportunity for PV-product makers to gain market share longer-term through upgrading equipment now…"
Consumers have tremendous expectations for future energy services. However, they are largely unaware that they need to take a more active role in managing energy decisions for their visions to become reality. In many cases, consumers lack even the basic knowledge necessary to accomplish this. 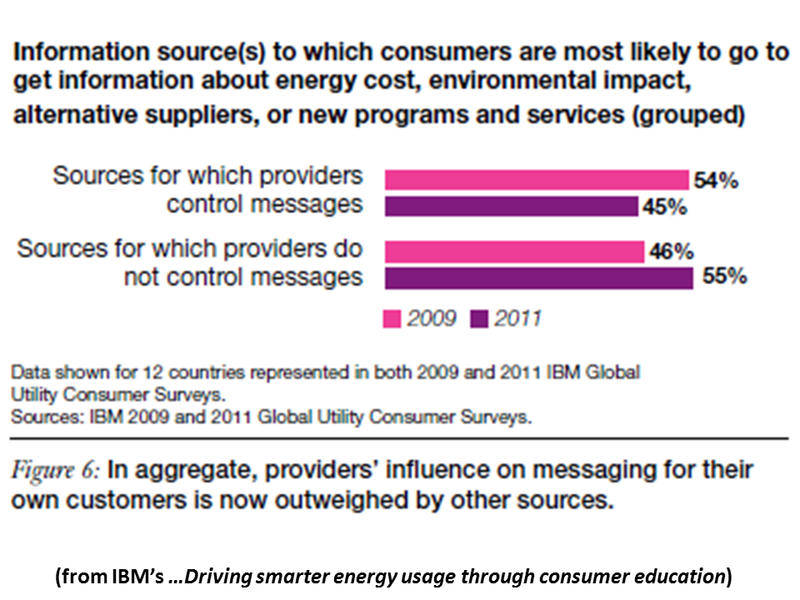 Utilities and other smart grid advocates need to improve information transfer to consumers to build broader support and the customer engagement that can follow. Delivered through trusted and generation-appropriate channels, this information must address consumers’ specific knowledge levels, most important motivating influences and current perceptions of providers. In the past two years, smart meter deployments have begun in some places and moved into final planning stages in others. In the process, this rosy view of the future often became clouded by uncertainty and confusion, driven by more imminent concerns and by influencers with a variety of messages. 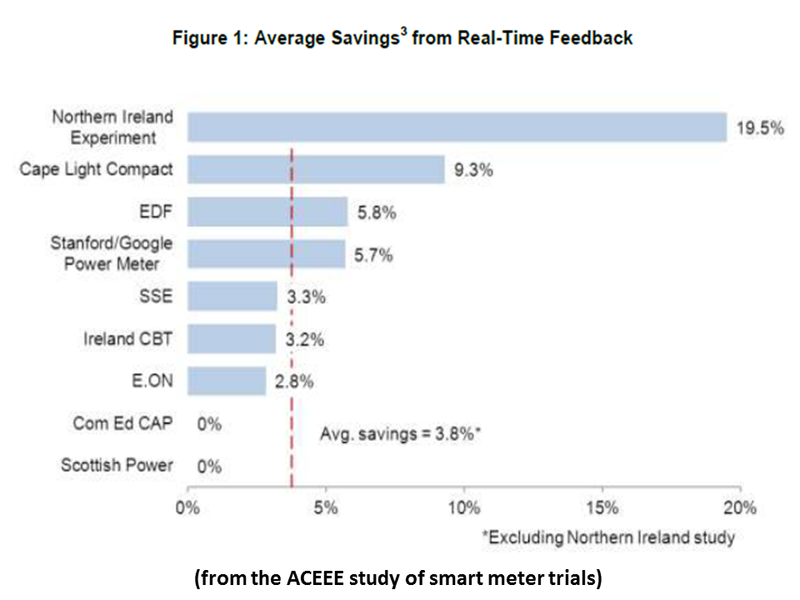 Some consumers are now raising questions: Are smart meters really accurate? 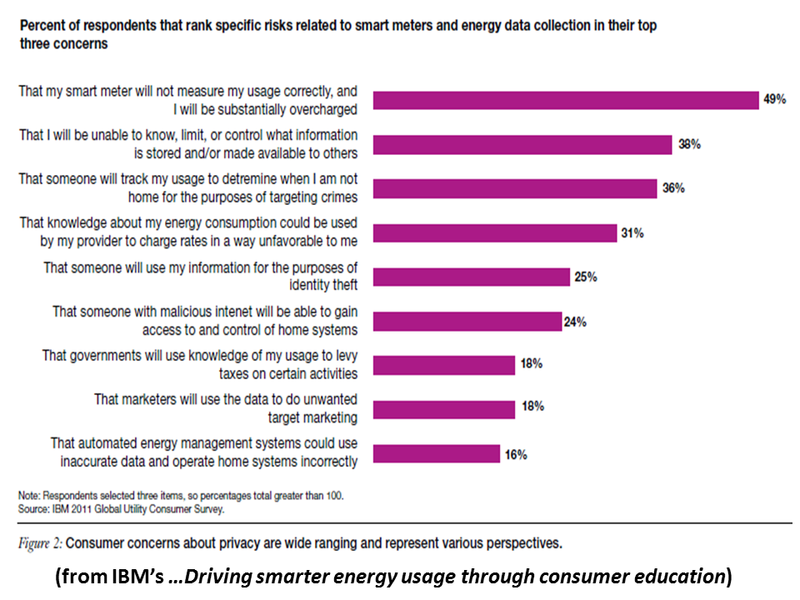 Is the collection of energy data a threat to my privacy? Will criminals know more about me and my family through my smart meter readings? What has been in many ways absent from the picture is the question of how people feel about the paths that would have to be traversed to get to an attractive future state where smart grids and smart meters provide improvements in energy use, environmental impacts and cost management. From our prior surveys, we know that consumers like the idea of having cleaner power options and more control and efficiency at their fingertips. But have they assumed these benefits would be accessible immediately once a smart meter was attached to their homes? Do they have sufficient understanding that, in order to optimize these benefits, changes in energy consumption patterns and more permission to access information about that energy usage might be required? 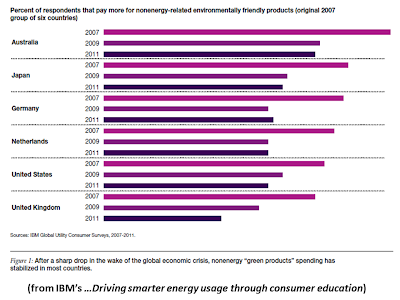 With questions like these in mind, we prepared our 2011 Global Utility Consumer Survey for launch to more than 9,000 respondents in 15 countries…This time, our primary focus was not the compelling products and services consumers want to see emerge in the future. Similarly, we did not highlight useful energy efficiency actions they might be able to take with better technology and data. Instead, we sought to discover the key set of interconnections that define a consumer’s current expectations: What perceptions are driving these expectations? How much underlying knowledge is behind the key perceptions? Finally, who or what factors are the strongest influences in developing that critical knowledge? •• Consumer perceptions established early on – such as saving money and reducing environmental impact – remain strong, but energy independence and national economic benefits, among others, are now getting similar levels of attention. 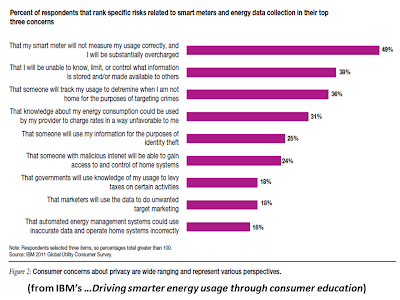 •• A newer perception – that of a privacy threat posed by the increased availability of energy data – has emerged strongly, shaping attitudes along several dimensions. •• Consumers’ knowledge about their energy transactions with their providers is strongly correlated with perceptions that impact willingness to embrace smart meters and change energy consumption patterns. 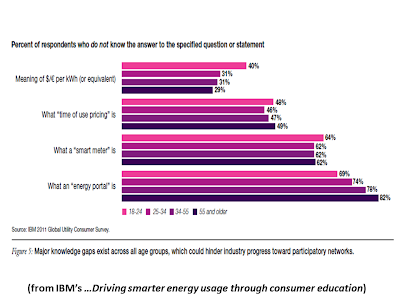 •• Despite its importance, the level of knowledge consumers have today about energy and their providers – even at the most basic levels – is unsatisfactory. •• Knowledge is retained in the context of core personal influences and passed on by trusted influencers. More fundamental information must be provided to consumers to increase this knowledge base – but through both traditional and new influencers, and with specific messages and channels tailored to suit different age groups. In some markets, this void in understanding has been aggressively tackled by forces both pro- and anti-change with messages delivered through a wide variety of channels. Many of these messages addressed valid areas of concern and presented important parts of the debate. However, some of the messages focused on negative outcomes that are highly unlikely with adequate protections in place. Others focused on more positive outcomes for which the timing and availability are not yet known with certainty. In combination, consumers are often getting conflicting messages that do not present a clear picture of the future. Influences that drive a consumer’s expectations take two forms: messages that most strongly influence motivations for change and sources that provide the strongest channels of delivery of knowledge and opinion. Each is important separately, but because of strong differences in their impacts on different age groups, their interaction is critical as well. Saving money remains the strongest behavioral influence overall. However, the importance of other influences is on the rise. In about half of the countries surveyed, motivations to change energy consumption behavior to help keep the national economy strong and improve energy security outweighed motivations based on improving impact on the environment. This was particularly true in the United Kingdom, the United States and Poland. In the other half, environmental concerns did outweigh economic ones, with Denmark, Canada and Chile leaning most strongly in that direction. Regardless of which influence played a stronger role in motivating change, the age of the respondent is a strong driver of what is important. Those 45 or older were as much as 40 percent more driven by concerns related to cost control, energy security and the impact of energy prices on the national economy. Conversely, among younger consumers – particularly the under-25 group – the influence of environmental concerns was much higher than for the 45-and-older group. If consumers are to be better informed and influences more targeted, what are the best ways to deliver the messages? The most effective channels of influence differ across age groups as well. Not surprisingly, the youngest age group we evaluated – age 18 to 24 – had some of the most distinctive factors. In this age group, people gravitate to energy information they can find online (particularly social media-based) to a much greater degree than older consumers. Online social networking was twice as often reported to be a primary source of information for respondents under 25 than for those 25 to 34, and six times more than for those 35 and older. Similarly, online video content was cited as a primary source of information five times more than for those 18 to 24 than for those 25 to 34, and nine times more than for those 35 and older. The most significant finding about messages and influences, however, comes from looking at the aggregate contribution of sources that have significant influence on consumers’ knowledge and perceptions. 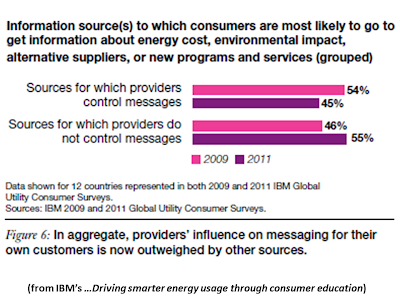 In this year’s survey, the percentage reporting that they use an information source that is not under the control of the consumer’s provider exceeds the percentage that uses a source directly under the control of the provider…This finding points to a major shift in messaging power. 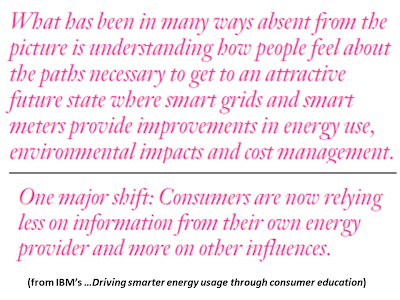 Consumers are now relying less on information that comes from their own energy provider and more on other influences. The effect increases when looking at the emerging economies and is stronger for younger consumers than for older ones. These findings seem in line with the diffusion of information and opinion via the Internet, mobile applications and social media – a phenomenon that is changing the way companies in almost every industry engage their customers. Making choices: Too much of a good thing? Often, industry advertising campaigns focus strongly on a particular long-term impact that smart meters and smart grid technology may have on the individual – such as cost, environmental impact, reliability or reduced dependence on nondomestic energy sources. These core themes are often deployed across a broad media spectrum and centered on a simple, easy-to-understand message addressed to the broadest audience possible within the entire consumer base. In general, energy providers and utilities have done a good job of painting a vision – getting consumers, regulators and the media to imagine what possibilities new energy technologies lend to the future. They have also garnered a sense of what new products and services might create the greatest value and satisfaction. 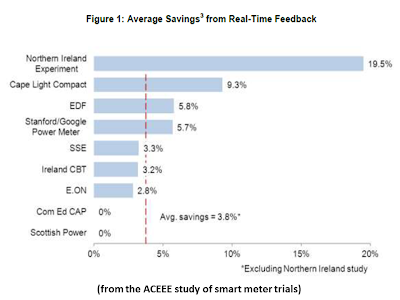 However, this successful communication of the broad societal case for smart grid and smart meter technologies may have created an environment in which the long-term possible benefits have come to represent the immediate expectation of benefits. This has created an opening for influential parties – who now have a stronger voice than ever due to consumers’ increasing reliance on sources outside their providers’ control – to paint this gradual build-up of capabilities and benefits as a failure to provide them at all. Without a good core knowledge level on which they can rely, consumers can only work with what they learn through their most trusted channels, even if inaccurate. This is why it is critical to recognize that almost half of consumers are deficient in even basic knowledge. The good news that comes out of this survey is if that knowledge core can be improved, higher levels of approval and willingness to engage are likely to follow, and system and societal goals can be easier to meet. Regardless of their knowledge bases, consumers have perceptions that result from existing influences and knowledge levels must be taken seriously, as they are the most important factors driving expectations and willingness to engage. 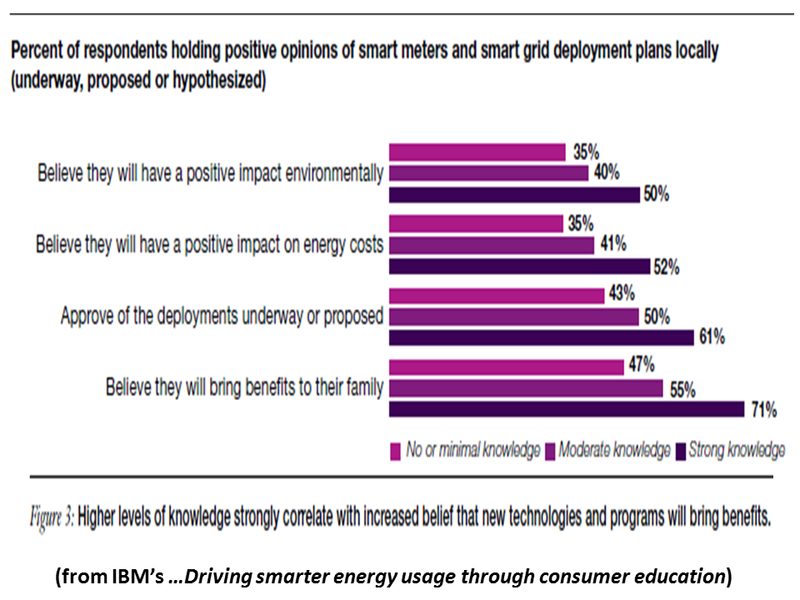 It will be critical for energy providers, governments and other parties with a stake in the future of the smart grid to discuss perceptions in an honest and complete manner, regardless of source or context. For example, perceptions on privacy are critical; tell consumers how each of them is being addressed in meter and data deployment and oversight plans. Even unrealistic perceptions should be addressed with an honest explanation of how any negative outcomes will be avoided or mitigated. Examples across other consumer impacts – such as meter accuracy, total costs and health effects – need to get the same scrutiny and care in communication. •• Recognize that certain motivators and channels of delivery hit specific demographic categories most effectively; align messages and channels to optimize impact. •• Leverage key lessons from behavioral science and economics to better align consumer response with knowledge resources and provider messages. 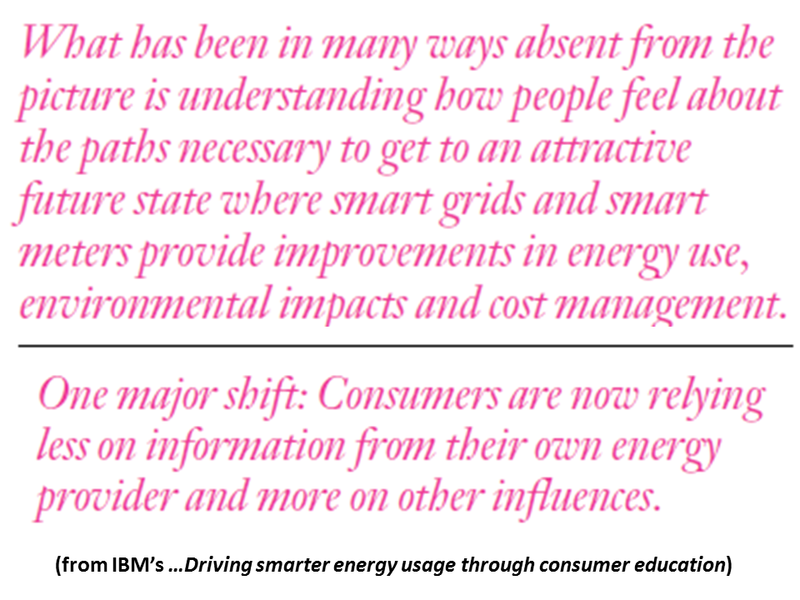 •• In the short term, forego the push to educate consumers on the details of smart meters and smart grids. Instead, renew focus on the most basic information for the majority, including assuring that data privacy protections are in place. Provide self-learning resources for those who are ready for more complex ideas. •• Consider a more social strategy for communicating knowledge and success stories to reach groups where traditional communication via bill inserts and advertising fails to connect with important groups of customers. This is particularly true for consumers with strong family dynamics and consumers younger than 25. 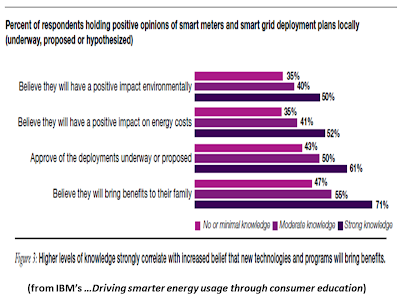 Navigating the consumer energy experience chain will be one of the core competencies in coming years that will help determine how smoothly smart meter and smart grid deployment will go and how engaged consumers will be. The industry needs to understand and manage the expectations of consumers by driving perceptions that are realistic in impact and timing of availability. This can only be done successfully if providers and retailers provide much-needed knowledge at the right level of sophistication – from very basic to fairly advanced – and do so through the most effective influencers for specific groups of consumers. If analyzed within the context of local demographics and dominant decision frames, this chain can build much-needed engagement and help ensure the right messages are reaching the right people through their trusted channels. "The plan echoes President Obama’s longtime call to [cut $39 billion worth of tax breaks for oil and gas companies over a decade in his fiscal 2013 budget request because]… the industry receives preferential treatment…Among other things, the plan would repeal the expensing of intangible drilling costs and percentage depletion for oil and natural gas wells." 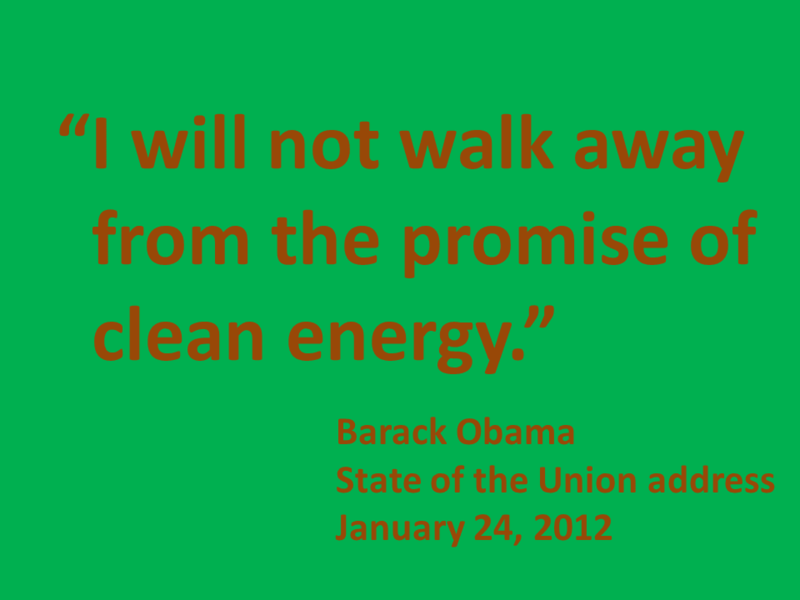 "Obama’s tax framework also calls for making permanent the production tax credit for [each kilowatt-hour of electricity that is produced], which is set to expire at the end of the year…A study commissioned by the American Wind Energy Association, the wind industry’s trade group, says that expiration of the production tax credit could cost as many as 37,000 jobs… Republicans have attacked plans to extend the tax credit…[and called it] an unnecessary subsidy for ‘Big Wind.’"
"The U.S. Department of Energy (DOE) has awarded $9 million in funding to its Bridging Research Interactions through collaborative Development Grants in Energy (BRIDGE) program for solar energy research and development. "…[As] part of the DOE's SunShot Initiative, research teams will be able to access the tools and staff expertise at existing DOE Office of Science research facilities so fundamental scientific discoveries can be rapidly transitioned to existing product lines and projects." "The BRIDGE program is the first within the SunShot Initiative to provide engineers and scientists who are developing solar technologies with the tools and expertise of the Department's Office of Science research facilities, including major facilities for x-ray and neutron scattering, nanoscale science, advanced microcharacterization, environmental molecular sciences, and advanced scientific computing. 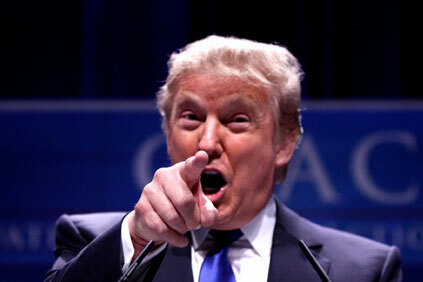 "…[The DOE said a] collaborative approach will accelerate innovations to lower the cost of solar technologies…"
"US entrepreneur and TV celebrity Donald Trump's war against the Vattenfall-led 100MW offshore wind farm in Aberdeenshire Bay, Scotland has taken a new turn with his company stating Trump will do ‘whatever it takes’ to stop the plans. "The Aberdeenshire Bay project is being developed by a Vattenfall-led consortium in Aberdeen Bay to test next-generation wind turbines. Trump is opposed to the project as he believes they will spoil the view from a golf course he is building nearby. The offshore project is currently going through the permitting process…Trump has ordered work on the golf course to be stopped." "…Trump is [reportedly] planning to work alongside anti-wind group Communities Against Turbines Scotland (Cats)…[and] back Cats financially…The issue puts the Scottish government in a difficult position. Although renewable energy is a keystone of the ruling Scottish National Party's policy, the party's leader and Scottish first minister Alex Salmond has previously thrown his weight behind Trump's plans…"
[Dan Barlow, head of policy, World Wildlife Fund Scotland:] "Given the urgent need to tackle climate change it is deeply depressing to hear in detail how Donald Trump intends using his vast wealth to try to kill-off one of the clean, green solutions available to the people of Scotland." "…[A new forecast predicts] that overall electricity generation will decline from 625TWh in 2010 to 590TWh in 2020, due to energy efficiency measures and increased imports (which will be needed to fill part of the gap left by the nuclear plant closures). 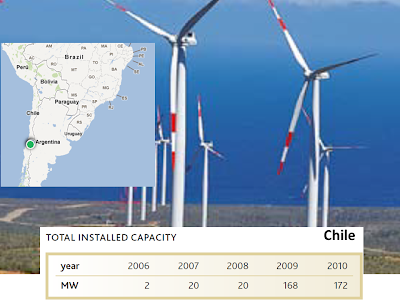 However, the installed capacity is set to rise from 153GW to 179GW in 2020. This is mainly because of the growth in wind and solar, both of which have relatively low availability and need to be supported by back-up power such as gas turbines…"
"…Solar PV capacity is forecast to treble while wind will grow by average of 2GW per year…Energy efficiency will play an important role in the reduction in demand; the Energy Efficiency Act (EnEfG)…[aims] to reduce energy consumption by 9 per cent in 2020, in comparison to consumption 2001-2005. 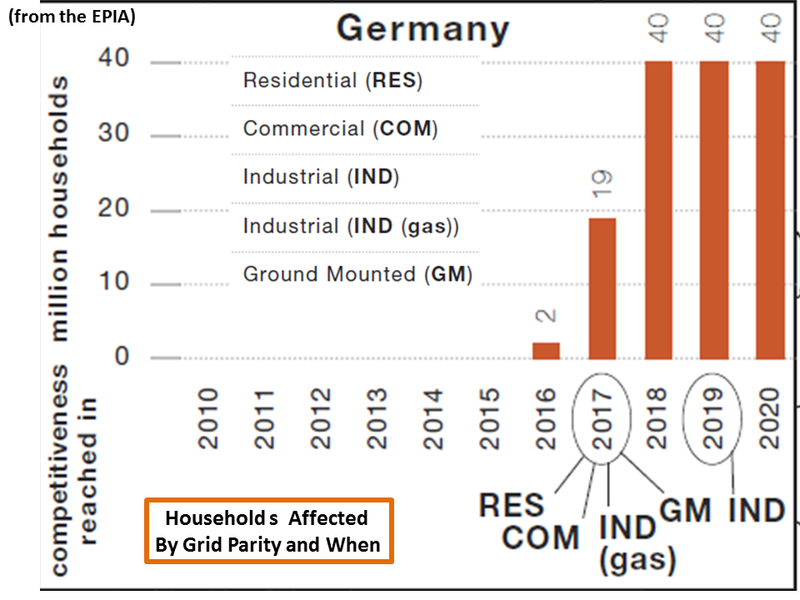 "…[F]rom now till 2020…coal will remain the leading fuel (37 per cent of generation) but Germany will experience a decline in lignite-fired output as older power stations are decommissioned…[There will also be] an increase in [the] share of gas through an accelerated development programme – though greater shares [are] anticipated post-2020…"
"Ireland-based developer Mainstream Renewable Power has inked a new 50/50 joint venture with China’s Xinjiang Goldwind Science & Technology of Beijing for a wind project in Chile. "Goldwind’s US subsidiary is supplying 47 of its 1.5MW direct-drive permanent-magnet turbines for the first phase of Mainstream’s Ckani project in Antofagasta, northern Chile. 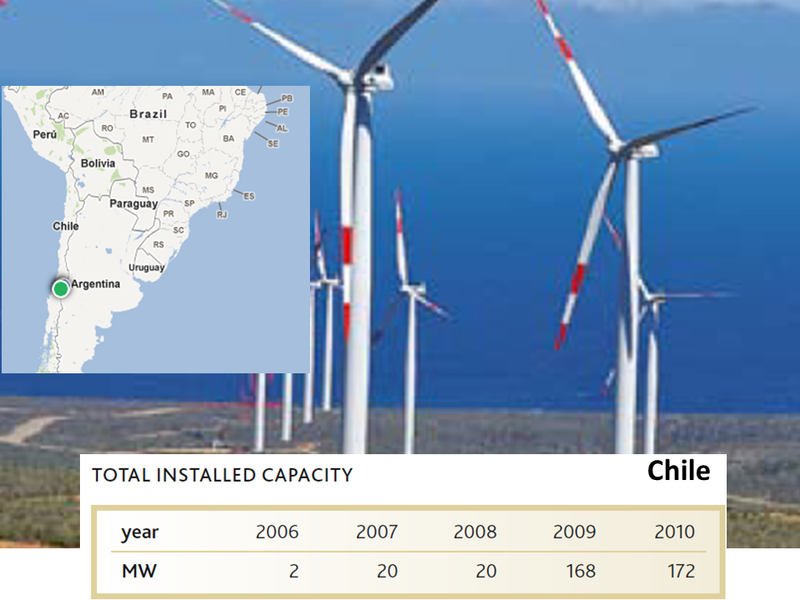 Construction is expected to start this year…The Mainstream/Goldwind deal will use non-recourse financing from the China Development Bank (CDB)…"
"Previously, Mainstream bought 23 of Goldwind’s 1.5MW turbines for the 34.5MW Negrete Cuel project, also in Chile…Negrete Cuel was the first Western-owned wind venture to use CDB non-recourse financing. "Goldwind’s 106.5MW Shady Oaks project, to be completed this quarter in the USA, was bought from Mainstream…A publicly traded firm, Goldwind has a $6 billion credit line from the CDB and $5.5 billion in internal financing from Beijing Tianrun New Energy Investment, a unit of the CDB." "The suspensions may be short-lived because the average spot price for the most expensive ingredient in making solar panels rose 9 percent since mid-December from a decade low [driven by a shift from European demand to China’s anticipated domestic demand]…[Chinese producers will double the number of panels that will be installed this year from the 2.2 gigawatts erected in the country in 2011]…"
"…[Chinese authorities and industry analysts] forecast prices will jump to $40 to $50 a kilogram this year. That’s enough to prompt a return to production in the first half of most of the halted plants, which…[are] about 30 percent of the total…Polysilicon will average about $30 this year, and companies including the units of Baoding Tianwei and Dongfang Electric will probably resume production as early as May…Bloomberg New Energy Finance has forecast polysilicon average spot prices to reach $25 per kilogram this year." 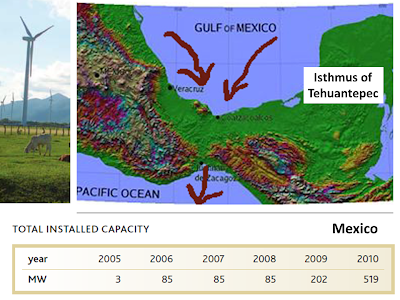 "Mitsubishi has taken a stake in a Mexican project to build a 396MW wind farm using Vestas 3MW offshore turbines… [Located on the wind-rich] Isthmus of Tehuantepec, in the La Ventosa region of Oaxaca of Mexico, [it] will be developed by Marena Renovables. The isthmus represents the narrowest piece of land separating the Gulf of Mexico and the Pacific Ocean. "When complete, [Marena] will be the largest project in Latin America…Under the deal, Mitusbishi will own 34%...Other investors are Macquarie Mexican Infrastructure Fund and PGGM. Mitsubishi, which is developing its own 7MW offshore turbine, said it hopes to gain operational experience through the development of the project." "Power purchase agreements are in place with beverage manufacturers Fomento Económico Mexicano, the world's largest bottler of Coca-Cola, and Cerveceria Cuauhtémoc Moctezuma, which produces Heineken…In November last year, The Inter-American Development Bank (IDB) has approved a $72 million loan to develop the project. 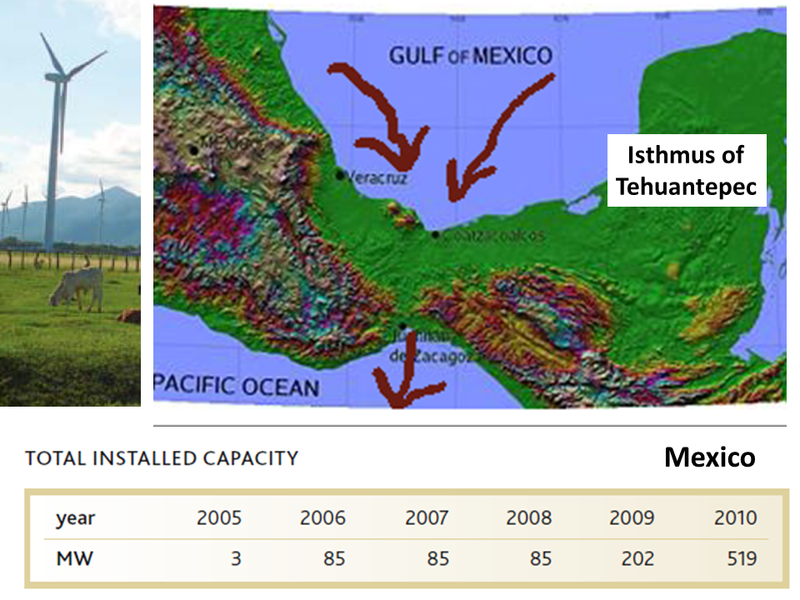 "Oaxaca is arguably a stronghold for Mexican wind energy and, as a result of its position on the coast and high wind speeds, represents around two-thirds of the country's wind capacity." TRUST Arizona from Our Children's Trust on Vimeo. This may seem like a story about water but it's really a story about the future. 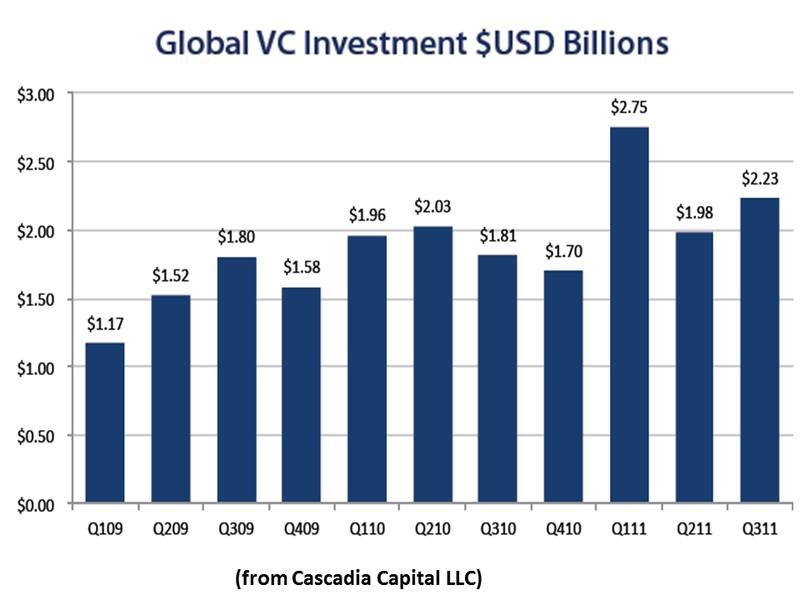 "At Cascadia Capital, we predict that  political and economic debates will drive increasing interest throughout the sustainable industries this year. We also believe that financing and M&A will continue to accelerate, led in part by activity in the solar and energy efficiency sectors…1. 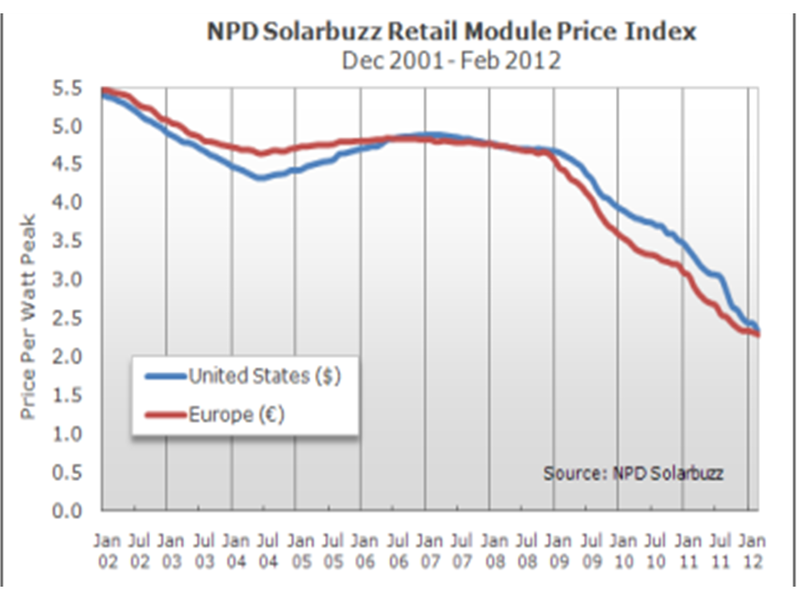 Renewable project financing market in turmoil as European banks pull out…2. Renewable energy and climate change come back into public focus as XL pipeline protests gain attention…3. 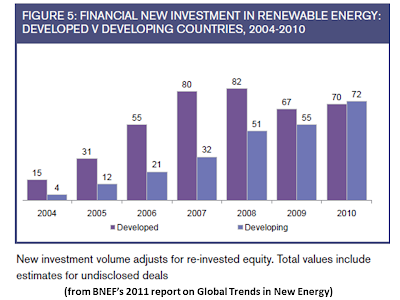 Renewable energy M&A accelerates, led by energy efficiency…4. Despite speculation, solar continues to dominate the renewable energy mosaic…"
"Renewable energy will come to the forefront of many political and economic discussions in 2012 due to the presidential election, environmental policy debates, and decreased investment by European banks. 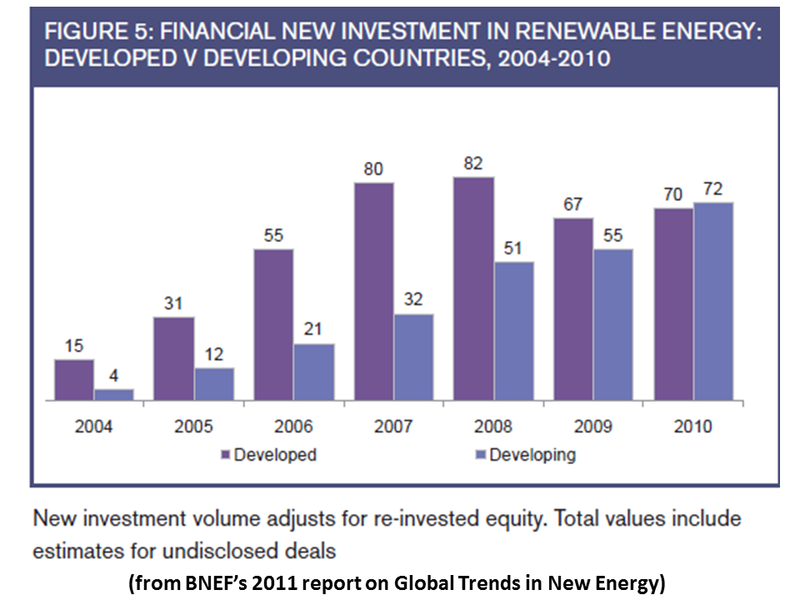 Despite some uncertainty in the market, we believe renewable energy project financing will remain steady in 2012 due to investment from alternative sources. We expect this dynamic industry landscape to be highlighted by M&A in energy efficiency, and continued adoption of solar as the barriers to entry rapidly decline." "Lego-owner the Kirkbi Group has acquired a 32% share in the 277MW Borkum Riffgrund 1 offshore project from Dong Energy.. Dong has sold an additional 18% to the Oticon investment group. The move is part of Dong's strategy of selling off the 50% shares in its offshore projects. The total deal is worth DKK 4.7 billion (€633 million). "Borkum Riffgrund 1 consists of 77 3.6MW Siemens turbines. Under the deal, Dong has committed to completing the project by a fixed date and price. The two companies will begin receiving a return on their investment on 1 October 2015. Any income prior to that date will go to Dong." 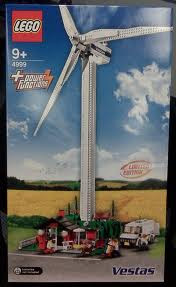 "This is not Lego's first involvement in the wind sector. The company is also a founder member of the WindMade trade standard for companies and brands who have invested in wind energy. The brand wants to 100% of its energy needs to come from renewables by 2020…to help enable future generations of children to grow up in a better world…"
"Solar City and homebuilder Shea Homes have partnered to launch a ‘no electric bill’ home option available to home buyers in all Shea Homes Active Lifestyle and Trilogy communities in Arizona, California, Florida, Nevada and Washington." "Homes with the option will be branded as SheaXero. 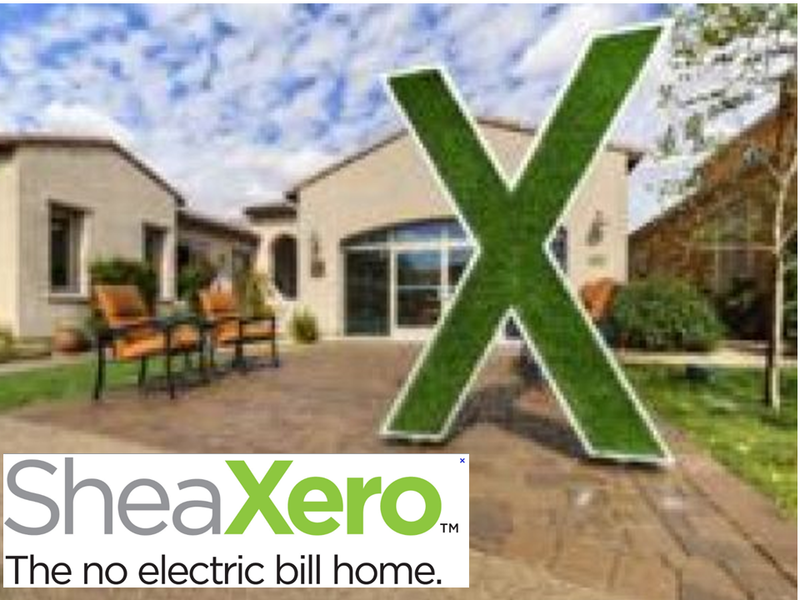 SheaXero homes aim to achieve net-zero electric bills by generating as much electricity as they consume through a blend of energy-efficient features and a solar power system that is included in the home's purchase price…The partnership allows SolarCity to provide solar services to homeowners in Florida and Nevada for the first time…"
"The studies reviewed here tested various combinations of interventions, but we have limited our discussion to savings from interventions providing direct, real-time feedback on residential electricity consumption and prices through in-home displays, web interfaces, and prepayment meters…"
"One of the most promising results is that a small percentage of households in several of the pilots had large savings of up to 25%. We propose calling this group the cybernetically sensitive, because they seem to respond more readily to feedback." Middle income American households – broadly defined here as the middle third of U.S. households by income1 – are struggling. The recession has exacerbated long term trends that are putting downward pressure on these households, threatening fundamental aspirations like economic stability, secure retirement, and educational opportunities (Commerce 2010). Many middle income households are under significant financial strain, and rising energy bills are a contributor to this stress…Energy efficiency improvements have the potential to provide significant benefits to these households – by lowering bills, increasing the structural integrity of homes, improving health and comfort, and reducing exposure to volatile, and rising, energy prices. Middle income households are also responsible for a third of U.S. residential energy use (EIA 2005).3 Increasing the energy efficiency of their homes would deliver substantial public benefits: reducing power system costs, easing congestion on the grid, and avoiding emissions of greenhouse gases and other pollutants. 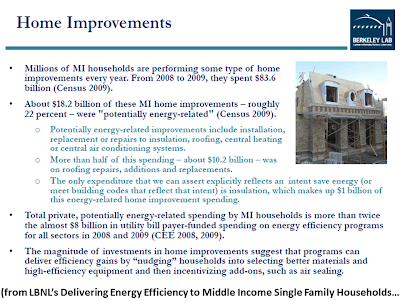 By comparison, total estimated program funding for multi-measure home energy efficiency upgrades targeted at all non-low income households is about $7.7 billion over the next decade.6 And while there is some private sector energy efficiency services activity occuring, the costs of delivering multi-measure energy upgrades to the middle income market far exceed both expected public resources and naturally occurring market activity. 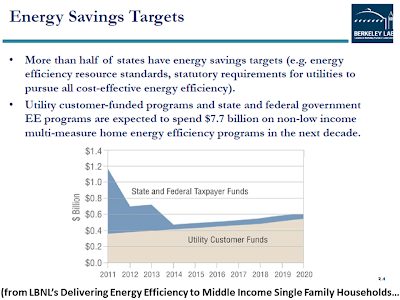 A more aggressive effort to target middle income households will require both significant customer contributions to fund these energy saving measures and an interlocking framework of supportive public policy and more innovative program design. 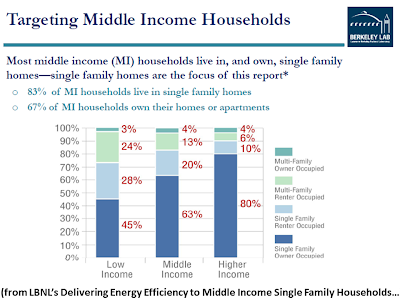 The large majority (83 percent) of middle income households lives in single family homes, and 67 percent of middle income households own their home (more than 75 percent of single family dwellers own their home) (see Figure 1). The highest concentrations of middle income households live in metropolitan areas, but chiefly in the smaller cities and suburbs outside of the largest cities. 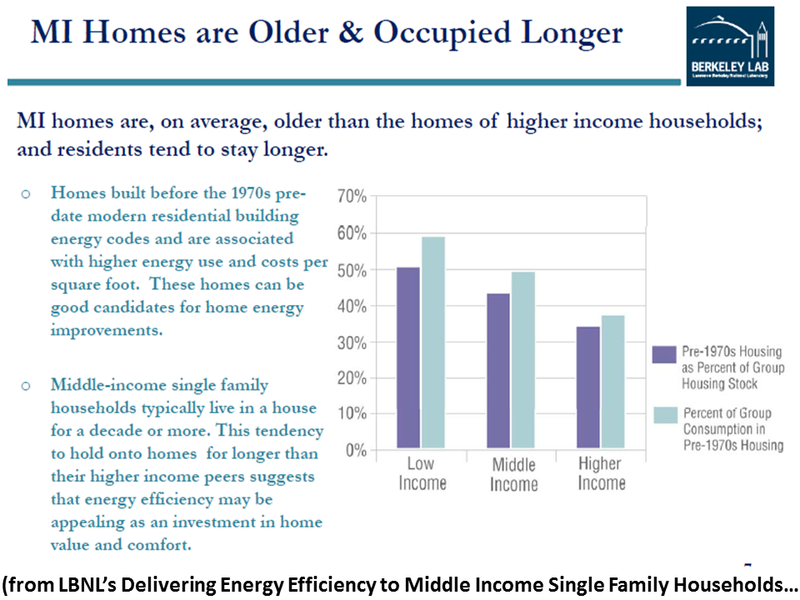 Their homes present good energy savings opportunities as they are are often older and less efficient than those of their wealthier peers. This report focuses on that 83 percent of middle income households who live in single family homes and either rent or own them – a total of 32 million U.S. households. 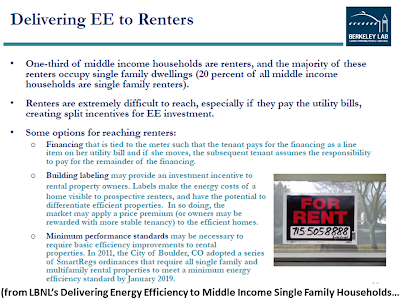 The question posed in this report is: How can programs motivate these middle income single family households to seek out more comprehensive energy upgrades, and empower them to do so? Research methods included interviews with more than 35 program administrators, policy makers, researchers, and other experts; case studies of programs, based on interviews with staff and a review of program materials and data; and analysis of relevant data sources and existing research on demographics, the financial status of Americans, and the characteristics of middle income American households. While there is no ‘silver bullet’ to help these households overcome the range of barriers they face, this report describes outreach strategies, innovative program designs, and financing tools that show promise in increasing the attractiveness and accessibility of energy efficiency for this group. 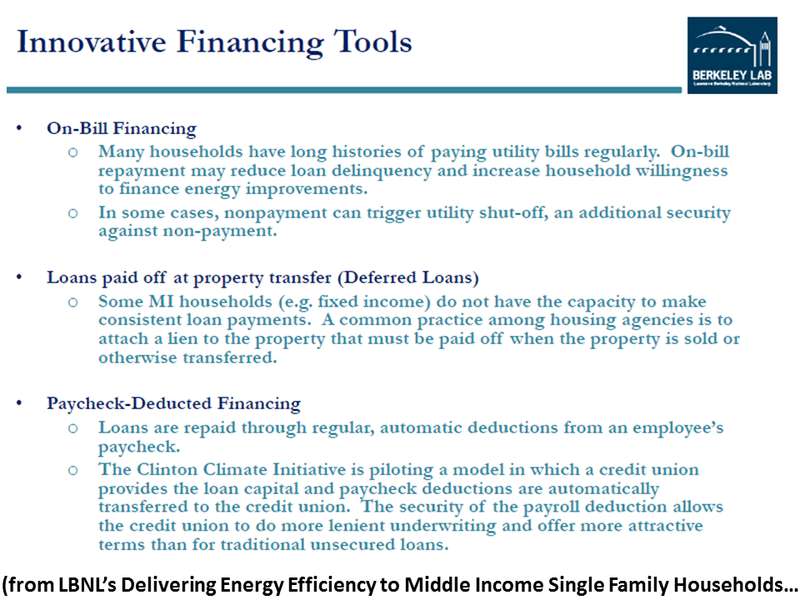 These strategies and tools should be seen as models that are currently being honed to build our knowledge and capacity to deliver energy improvements to middle income households. However, the strategies described in this report are probably not sufficient, in the absence of robust policy frameworks, to deliver these improvements at scale. Instead, these strategies must be paired with enabling and complementary policies to reach their full potential. A significant number of middle income houses have building structure and maintenance issues that reduce their value and can adversely affect the health and safety of their occupants. Households are often aware that these problems need to be addressed, but in an uncertain economy, households are reluctant or unable to invest scarce resources in making fixes before those problems turn into emergencies. Frequently, these problems must be addressed before – or in conjunction with – the installation of energy improvements. While more expensive in the short run, addressing non-energy issues as part of energy efficiency program delivery can attract more participants and address important health and safety hazards. The following program elements may make addressing these issues easier for programs and households alike. �� Leverage Weatherization Contractors. The existing network of more than 1,000 organizations that deliver the services of the federal Weatherization Assistance Program may have the skills and experience needed to serve middle income households with both energy and non-energy housing issues. �� Allow Non-Energy Measures in Energy Efficiency Financing. Allowing households to use a portion of their energy efficiency loan for non-energy measures may be an attractive way to address these issues. �� Coordinate Public Funding from Multiple Sources. Streamlining existing funds and services can reduce intervention costs and enhance benefits for households by presenting the homeowner with multiple complementary services in a single, coordinated package. 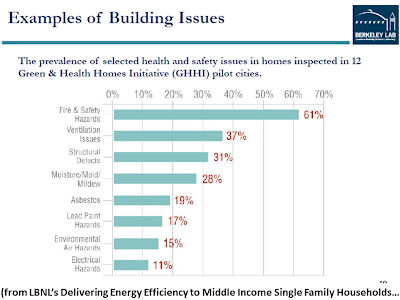 For example, the Green & Healthy Homes Initiative is bundling weatherization services with home health services (such as lead hazard reduction and indoor allergen reduction) to implement a comprehensive assessment, intervention, and education program that improves health, economic and social outcomes of low and middle income families. 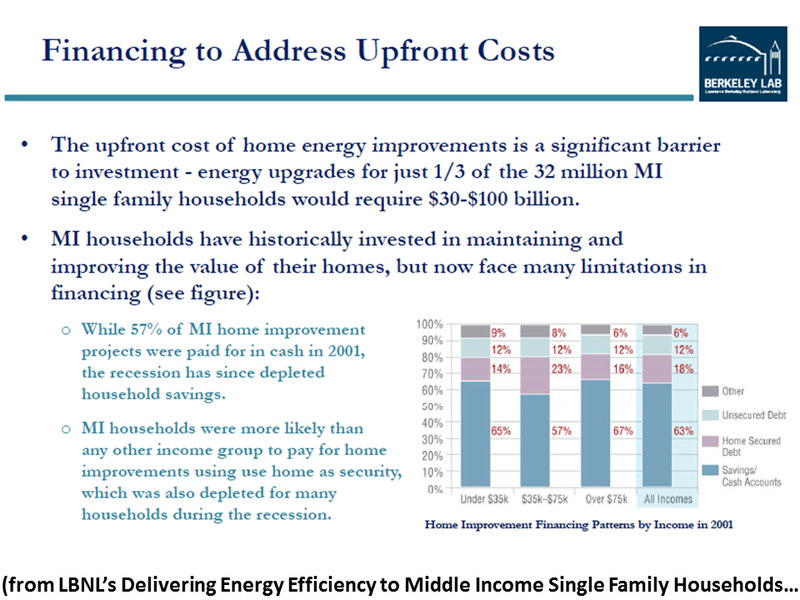 The upfront cost of home energy improvements is a significant barrier to investment. Middle income households have historically invested in home improvements, and many (65 percent) have not needed financing to do so (Guererro 2003). But the recession has depleted household savings, suggesting that many middle income households need financing to overcome this barrier. At the same time that home equity has declined, lenders have responded to increasing consumer risk by restricting access to other types of loan products. Today, many of the largest energy efficiency loan programs have application rejection rates in the 20-50 percent range – and these rejection rates are higher among middle income households than upper income households. �� Loan products that are paid off when properties transfer (deferred loans). Some middle income households – particularly those on fixed incomes – simply do not have the financial capacity to make consistent principal and interest payments on debt. This is especially true when the financed improvements lead to uncertain cash flow, or if building rehab needs to be funded in addition to energy upgrades, increasing net monthly payments. There are many housing and economic development agencies around the country that will fund home improvements through deferred loans – often health and safety-related rehab for fixed income seniors that have equity in their homes. No monthly payments are required, but a lien is attached to the property that must be paid off when the property is sold or otherwise transferred. �� Paycheck-deducted loans. Paycheck-deducted financing involves repaying a loan through regular, automatic deductions from an employee’s paycheck. 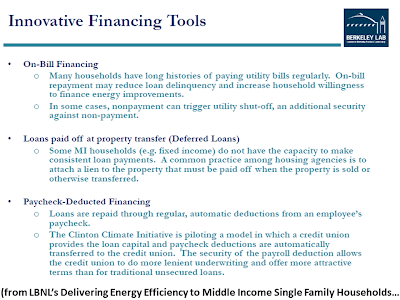 Under one model developed by the Clinton Climate Initiative, a credit union provides the loan capital, and loan repayment is deducted through payroll and automatically transferred to the credit union. The security of the payroll deduction allows credit unions to do more lenient underwriting and offer a lower interest rate than they would otherwise offer for standard unsecured loans. �� Property assessed clean energy (PACE). For those middle income households who have equity in their homes, PACE may be a promising financing tool if it gets past the current regulatory hurdles. PACE programs place tax assessments in the amount of the improvement on participating properties, and property owners pay back this assessment on their property tax bills. Like other property taxes, these assessments are treated as senior liens – which makes them very secure. PACE is debt of the property, which suggests that underwriting need not be based on a borrower’s personal creditworthiness (and that the financing can be transferred with the property) – potentially getting around the credit score and debt-to-income issues highlighted in Chapter 5: Access to Capital. PACE currently faces significant regulatory hurdles, which have largely eliminated its use around the country for the residential market, pending court rulings or federal legislation. While important for reaching middle income households, the program design, outreach and financing strategies outlined in this report are probably not sufficient to deliver energy improvements to this market at scale. Instead, they should be seen as potential bridges or complements to more robust public policies that bring additional focus and funding to bear on unlocking this energy efficiency resource. A range of policy options are discussed below – and several are likely to enhance energy efficiency across all markets, in addition to ensuring that substantial allocations are made for delivering home energy improvements to middle income households. More than half of the states have established energy savings targets of some sort through an Energy Efficiency Resource Standard (EERS), a statutory requirement for utilities to acquire all cost-effective energy efficiency, or energy efficiency goals that are described in utility resource plans. These states and the federal government are expected to spend $7.7 billion on non-low income multi-measure home energy efficiency programs over the next 10 years (SEE Action Residential Retrofit Working Group 2011). 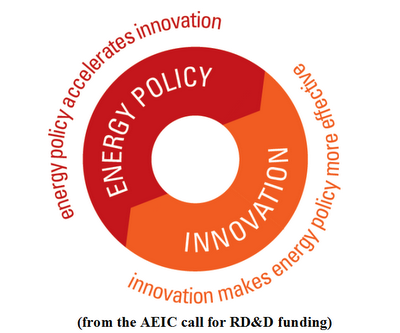 The design features of these policies influence the degree to which energy efficiency program administrators are motivated to provide more comprehensive home energy services. EERS’s with comprehensive, long-term savings goals and “all cost-effective” policy guidelines that consider a societal perspective (e.g. including social impacts, environmental externalities) are more likely to encourage comprehensive residential energy efficiency programs. Better funding for voluntary programs targeted at driving demand for middle income energy improvements are just one piece of an evolving effort to secure energy savings for the public at large. Additional policy options include codes, standards, labeling, and upgrade regulations. �� Codes, Standards and Work Specifications. 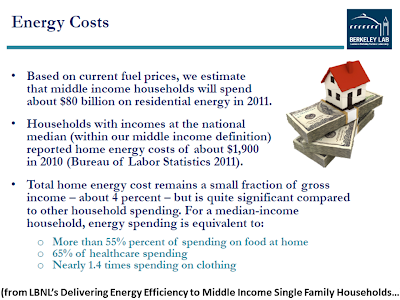 Building energy codes and appliance, lighting, and equipment standards can contribute substantially to efficiency among middle income households. “Reach” codes and financial incentives for even higher efficiency buildings and equipment can encourage market innovation. �� Labeling, Disclosure and Upgrade Regulations. Labeling and energy use disclosures can build a more efficient marketplace by making the full costs of operating a home more transparent to renters and homebuyers. These tools make energy efficiency more visible—and valuable—in the home real estate market. 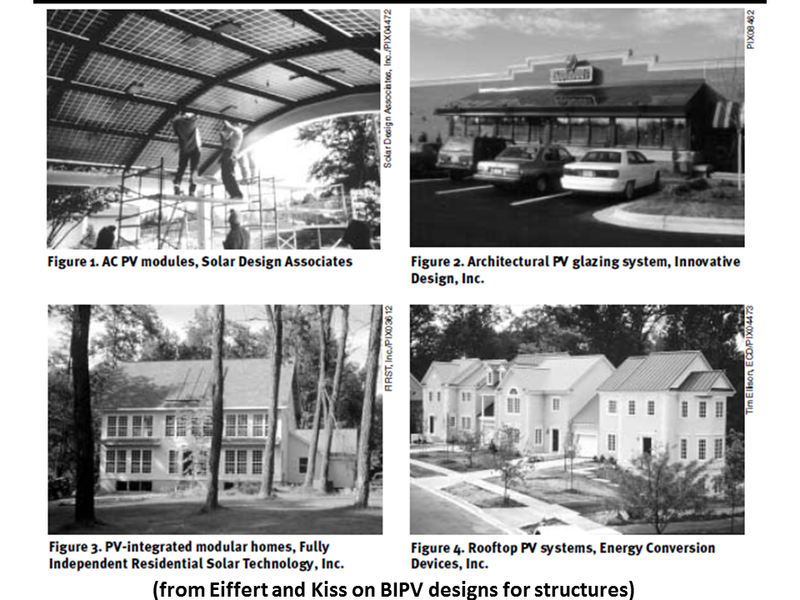 They can also build the foundation for the implementation of regulations as these disclosures can be transitioned into minimum energy performance standards. Augmenting voluntary programs with regulations may allow policymakers and energy efficiency program administrators to target limited public funds toward increased support for the most financially vulnerable low and middle income households. It is important to recognize that progress is being made on delivering home energy efficiency upgrades to the residential sector. Many residential energy efficiency program administrators are reducing their reliance on lighting and appliance rebates and increasing their emphasis on more comprehensive home energy upgrade program offerings. As the mix of residential programs evolve, contractors are adding to their skill sets and adjusting their business models. Despite this progress, improving the home energy efficiency of middle income households is a challenging prospect. There is no single solution to this challenge. 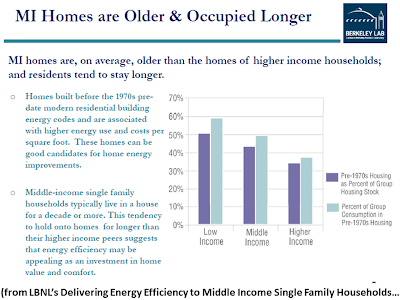 Beyond the significant barriers to driving demand that exist in the general population, middle income households face greater financial insecurity that can make proactive investment in energy improvements prohibitive. 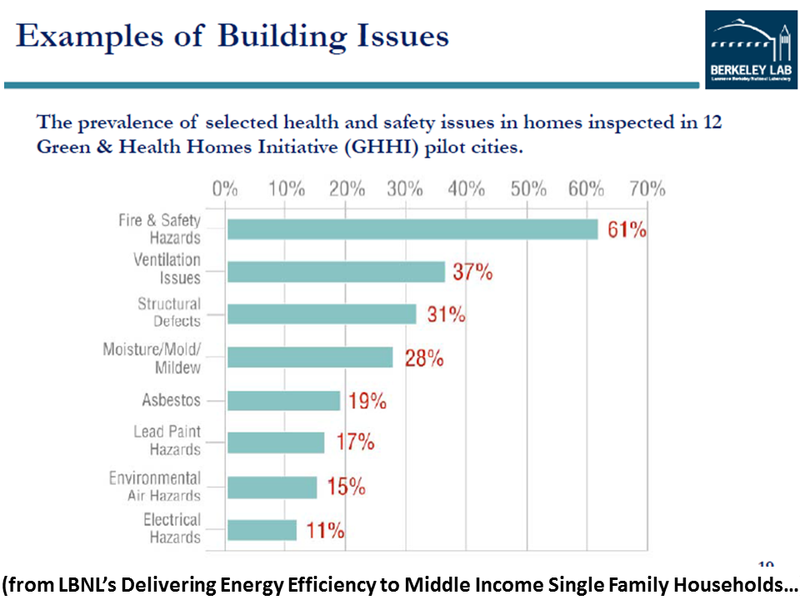 Those middle income households who are motivated to act are often unable to access financing or must address costly structural and maintenance issues in their homes before investing in energy efficiency. This report describes a number of financing tools, program delivery models, and outreach strategies that show promise in overcoming these barriers. However, it is clear that while these approaches may prove effective on the margin, they are not enough to be effective at the requisite scale for addressing broad public policy goals. Instead, these approaches should be seen as potential bridges or complements to robust public policies that provide access to energy efficiency for all market segments.